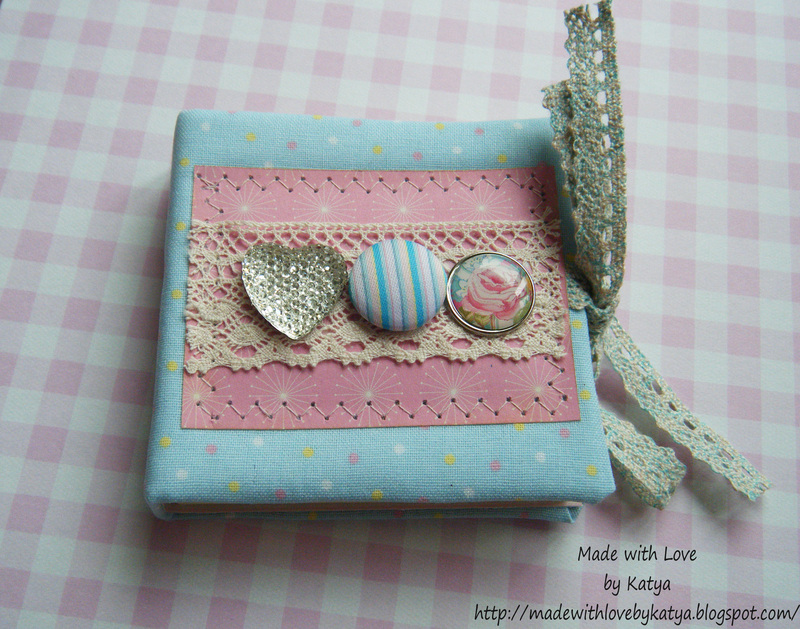 Today Katya is sharing a quick tutorial on how to make a fabric cover for a sticky note block. 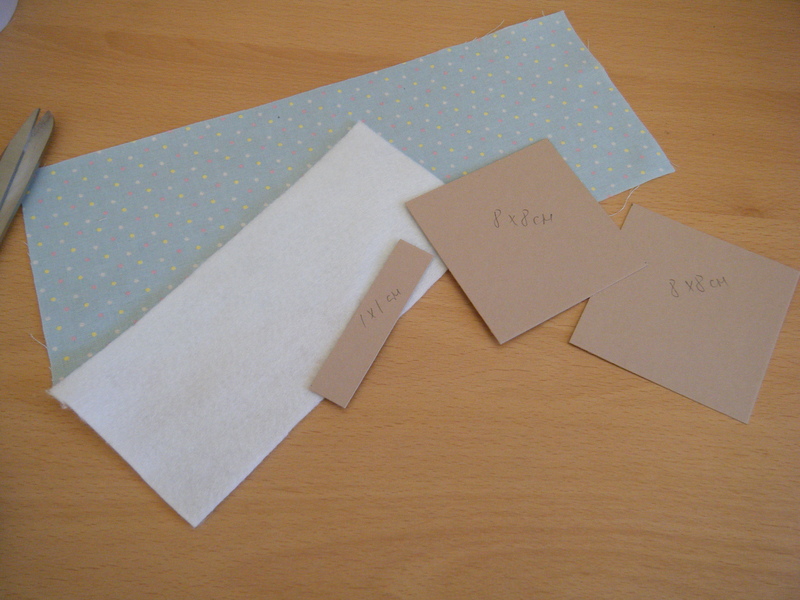 I had a few small strips of fabric left over from making some albums and I decided to use up the fabric scraps. 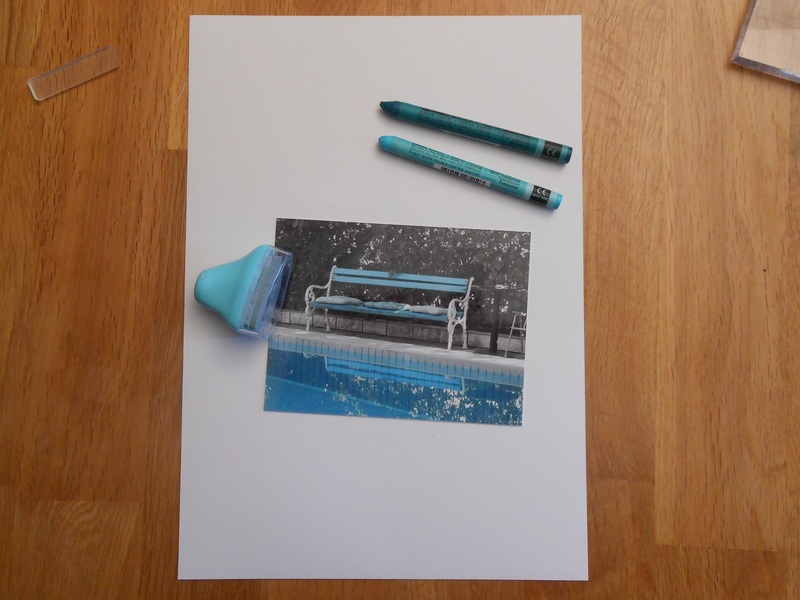 A quick present idea for schoolkids, students, office workers or teachers. embelishments- buttons, brads, flowers -whatever you like. 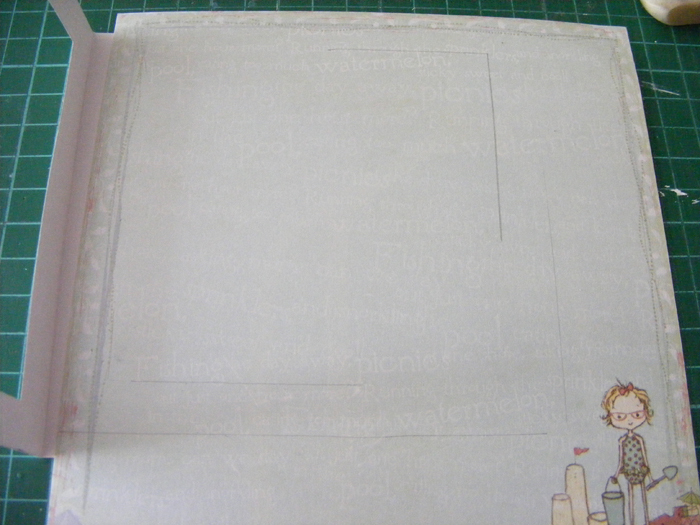 Moving onto the cover, first glue the corners and then the sides. Before we cover the inside of the block with papers, we need to decorate the cover. To decorate the cover I added a small scrap of paper so that I could hide the ribbon under it. And then I added some brads, make sure you are using embellishments which wont easily come off. we hope you liked this very cute idea and will try it out too. 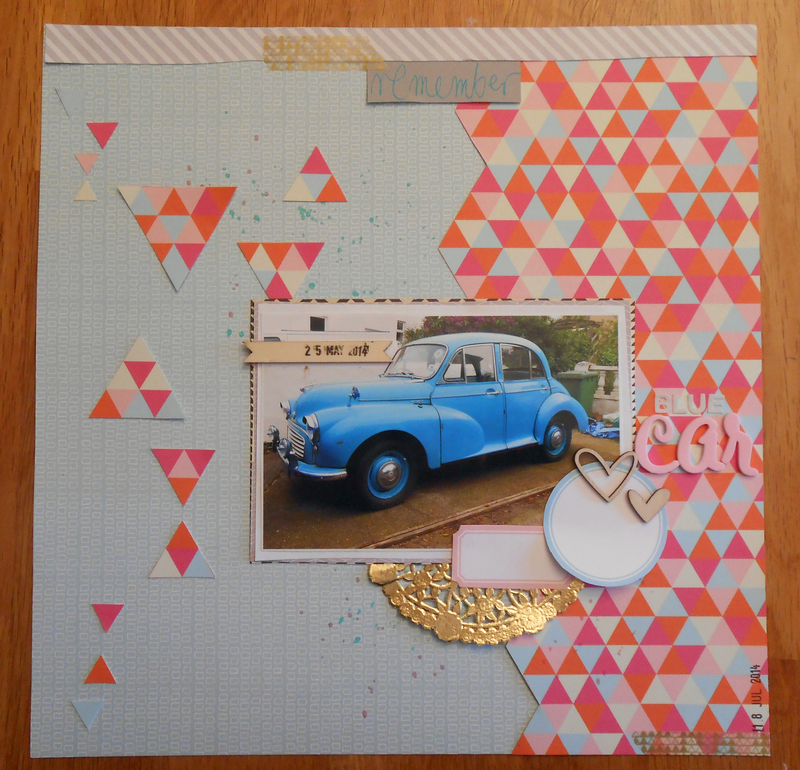 It is Timi here a quick Scrapbook page. 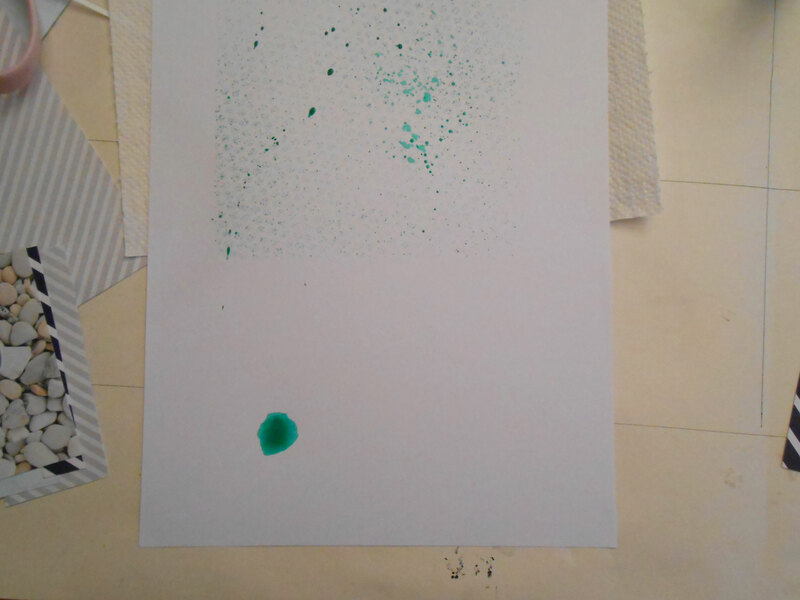 Using a stencil spray some ink on the white card stock to create a background. 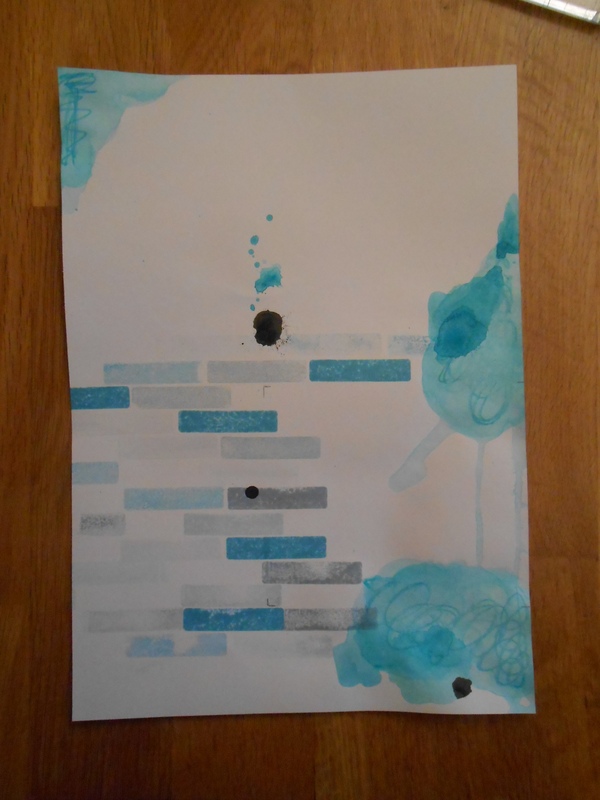 Add some splashes with the same ink on the page. Add a second colour for more interest. 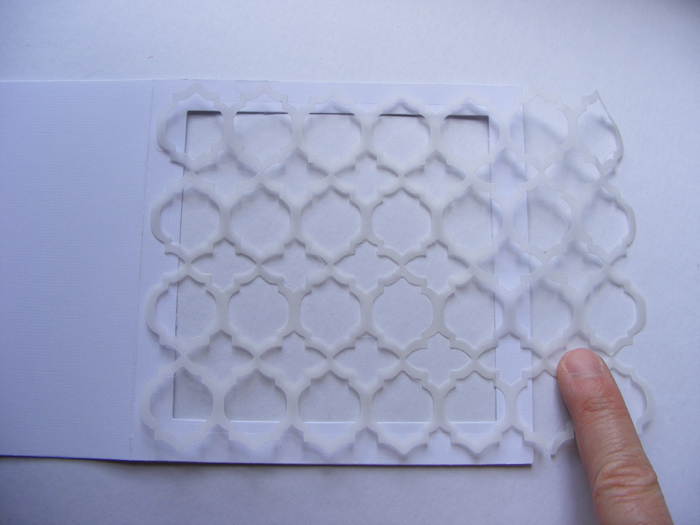 Cut patterned paper to the same height as you photo. You don’t need to use a paper trimmer. Just eye ball it and use your scissors. 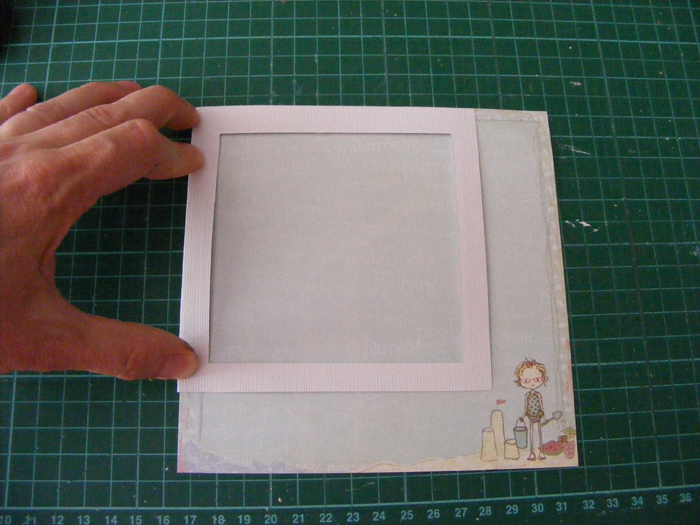 Start layering a piece of glassine envelope, journalling card and the photo with the patterned paper. You can add the title too. 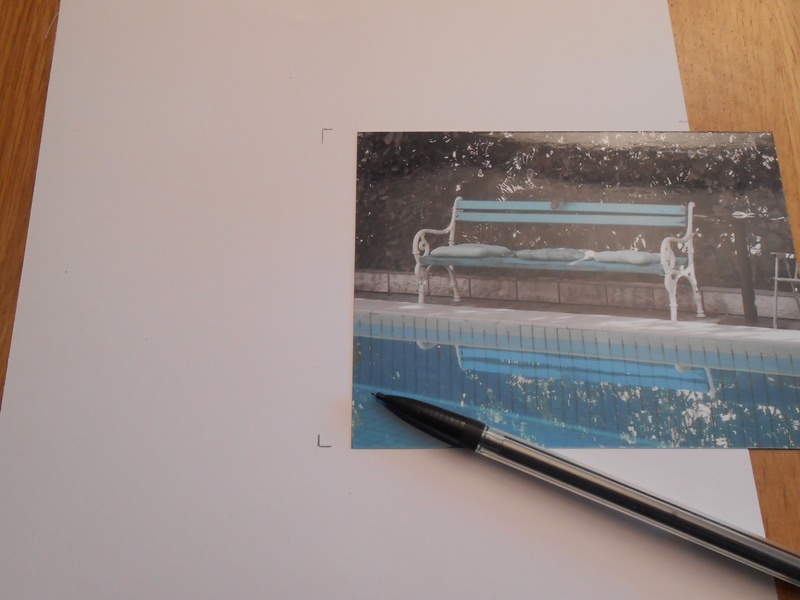 Cut a very narrow strip of paper to place on the top of the page and another one or two to the bottom. 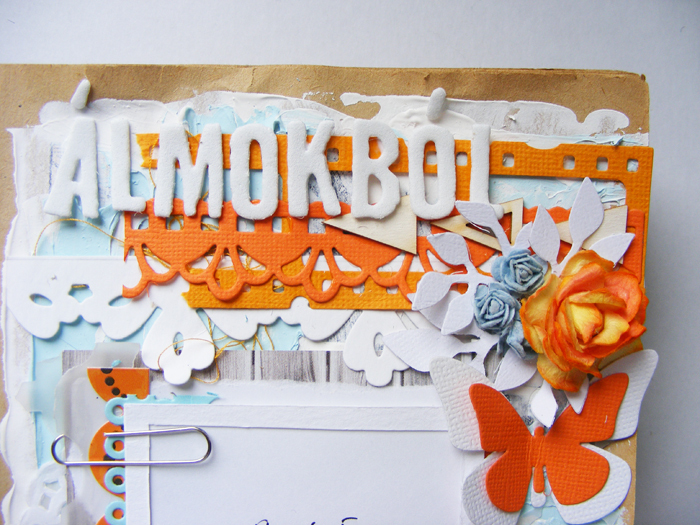 Add embellishments to your page and finish it with journalling. If you would like to know how I created the custom title watch this space, we will be back with some fun techniques next week! 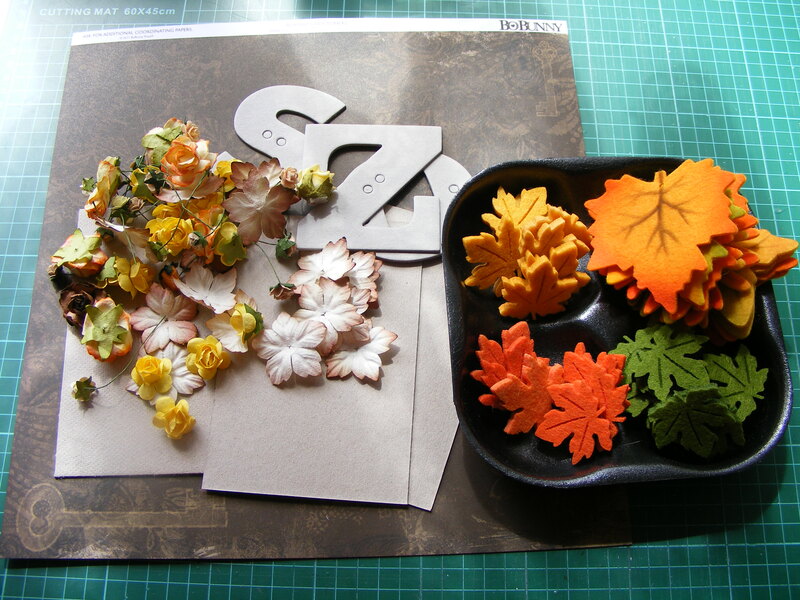 Today we are back with an Autumn Decor idea by Andrea Kovacs. 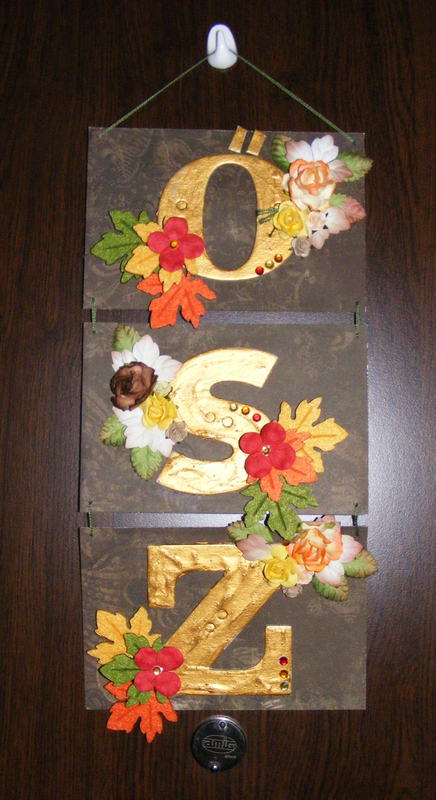 Andrea is going to show you how she created this fabulous door decor piece. 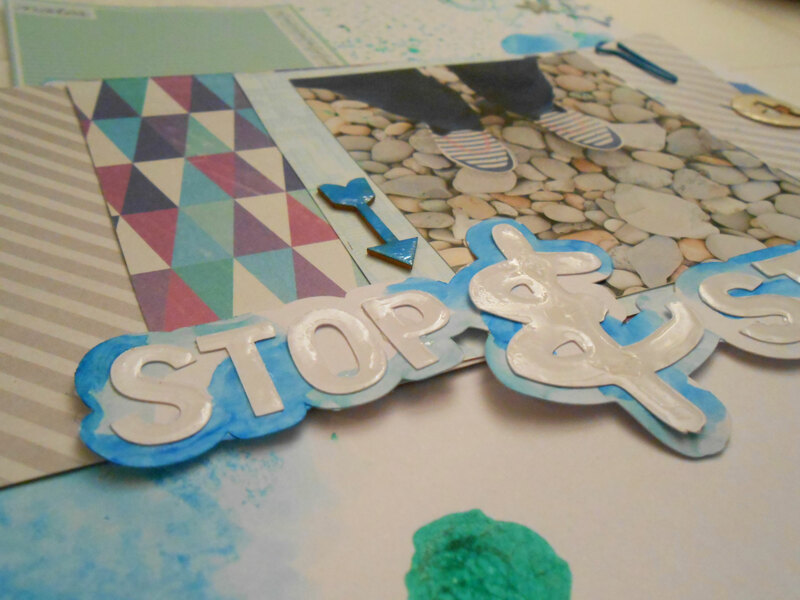 Cut out 3 chipboard rectangles or as many as you need for your word. In Hungarian autumn is only 3 letters so that’s why I’m working with three here. 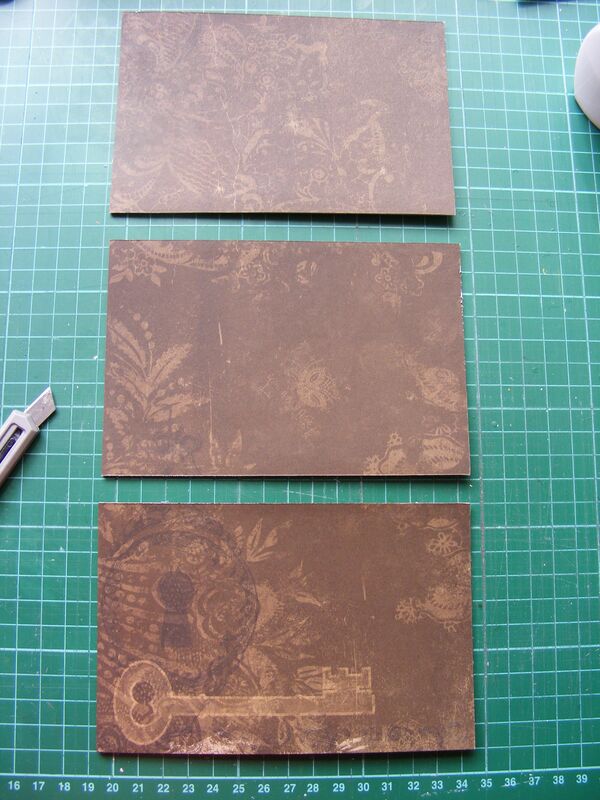 Cover the chipboard rectangles with patterned paper. 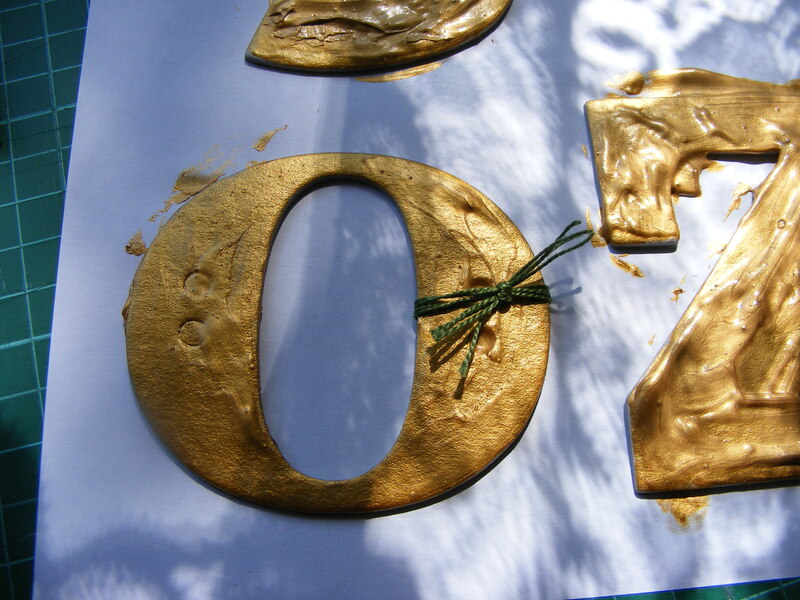 Apply acrylic paint on the letters. You could apply thinker layers for more texture. 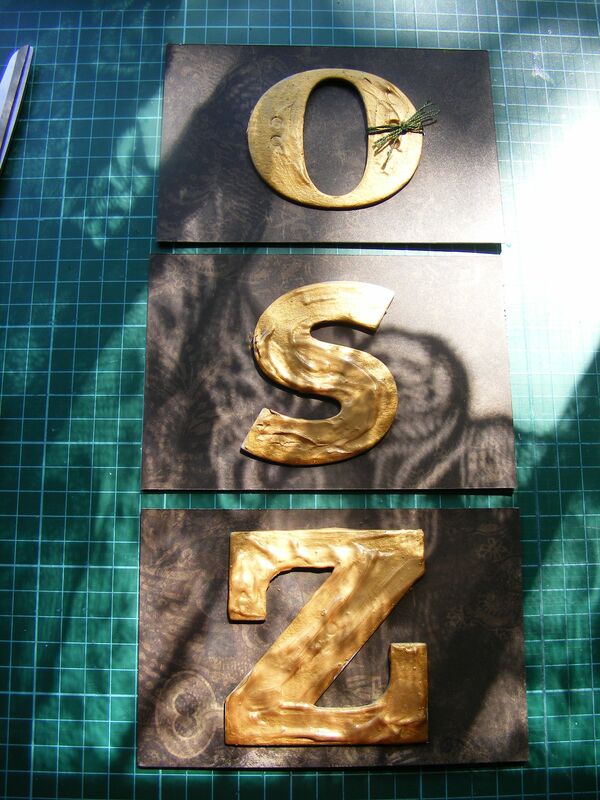 When everything is dry, it is time to adhere the letters to the chipboard backgrounds and decorate them. 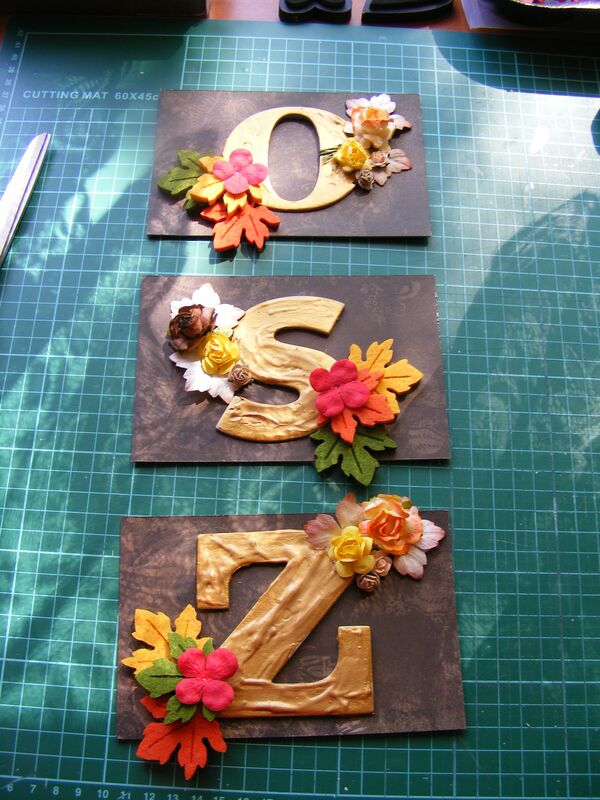 Arrange paper and felt flowers around the letters in nice bulky clusters. 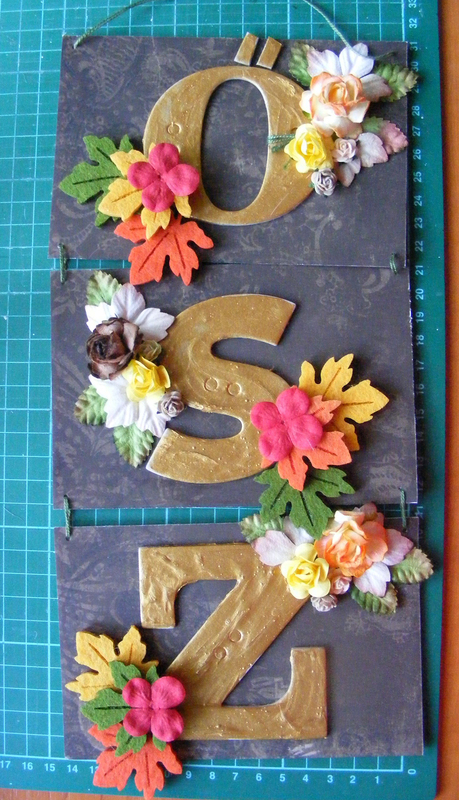 You could add some stamping on the letters if you like, or some rhinestones, enamel dots. Using some yarn or twine attach the pieces and hang them up on your door. 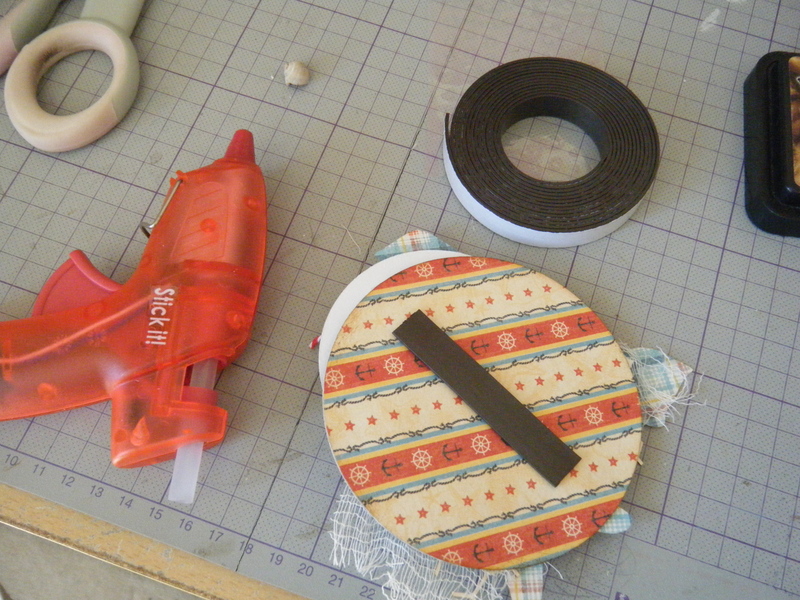 It is Timi back with another quick Project Life page. 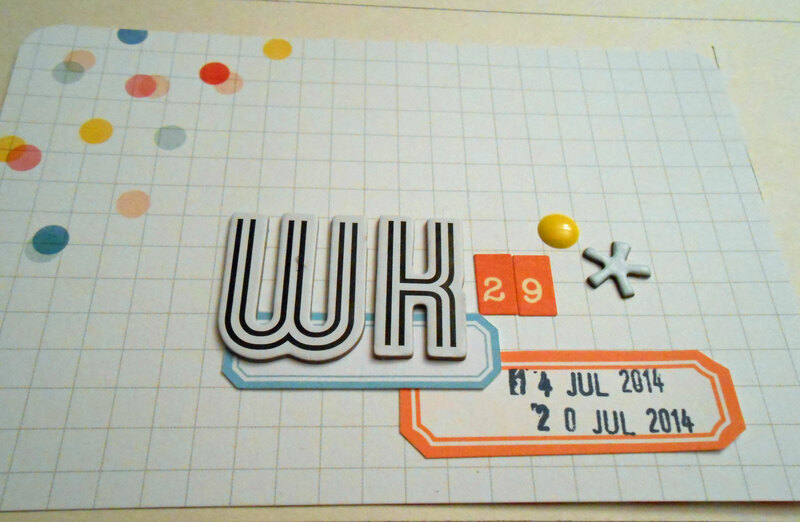 Recently I discovered a blog with lots of label print and cut files. 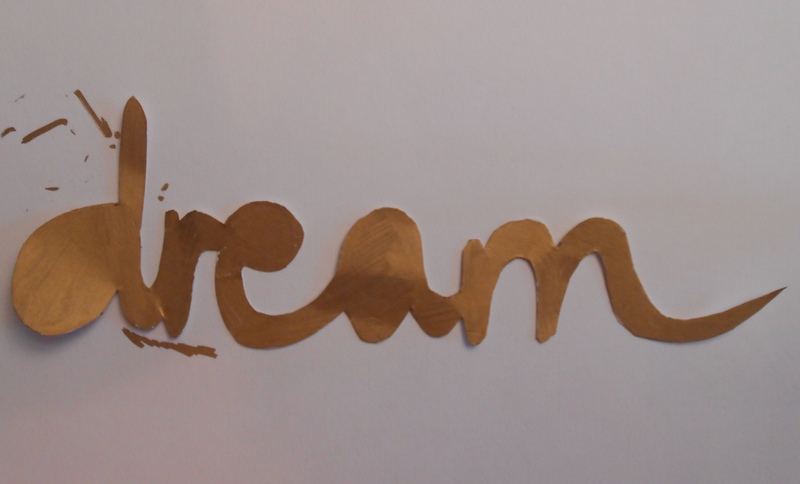 I love adding labels to my PL pages, so I was delighted when I found this blog. 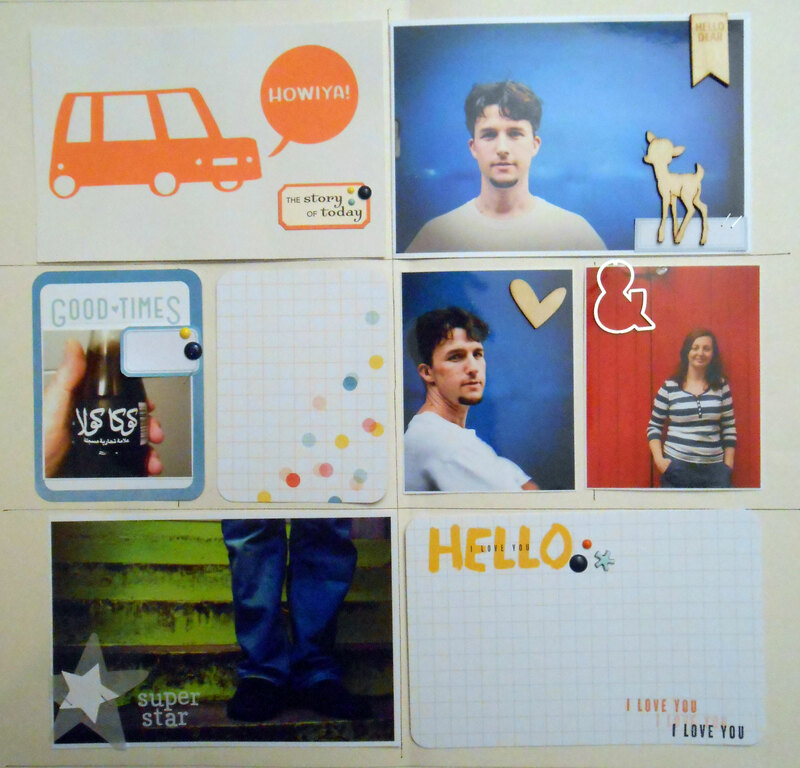 I use my Silhouette Cameo to print and cut out all the labels and it really only takes a couple of minutes to have lots of different labels. As always I started with placing my photos on my desk. 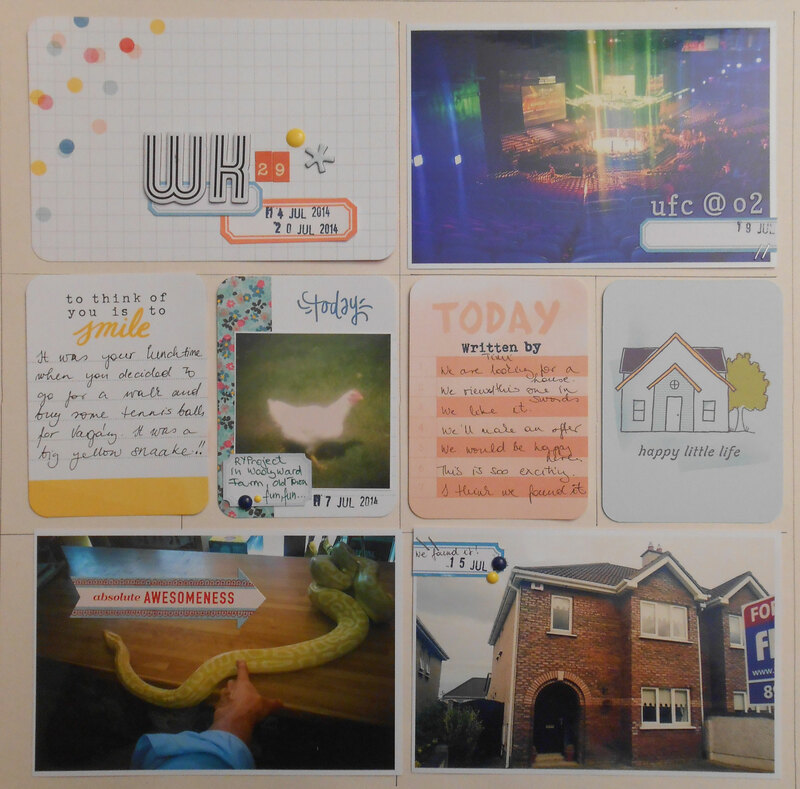 Then I filled the gaps with some Project Life cards. 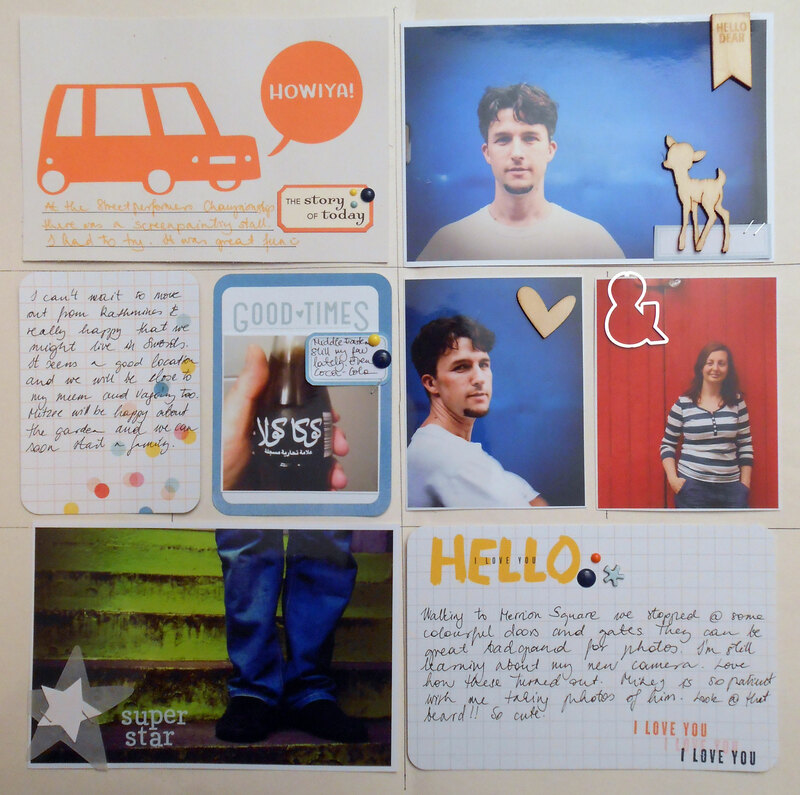 Most of the card are from the Dear LizzyDaydreamer Collection. 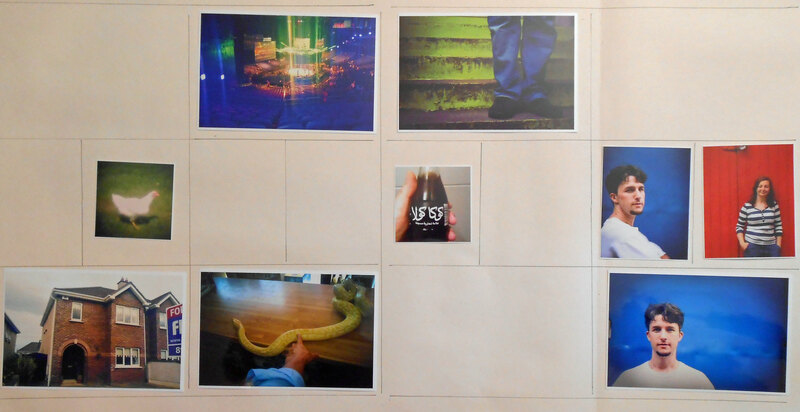 The next step was to place some of the labels on the photos. I like to place some of the label a little bit off the page to add a bit more interest. 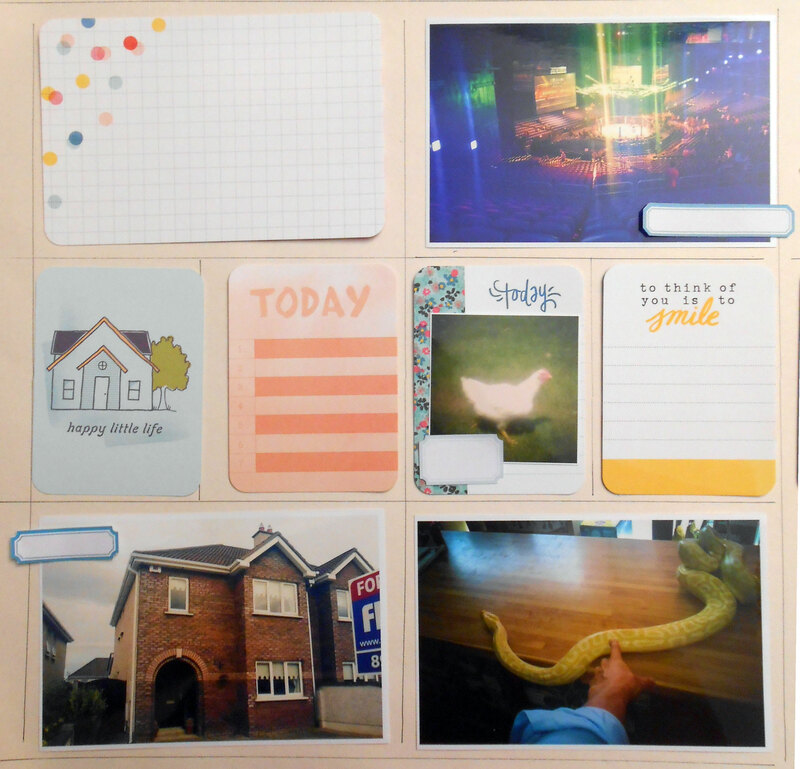 Labels are great to use when you have lots of photos in a spread and you don’t really have space left for journalling. Photography tip: There are lots of colourful walls, doors and gates in Dublin. I like to use them as background in my portrait photos. I also added some woodveener shapes. 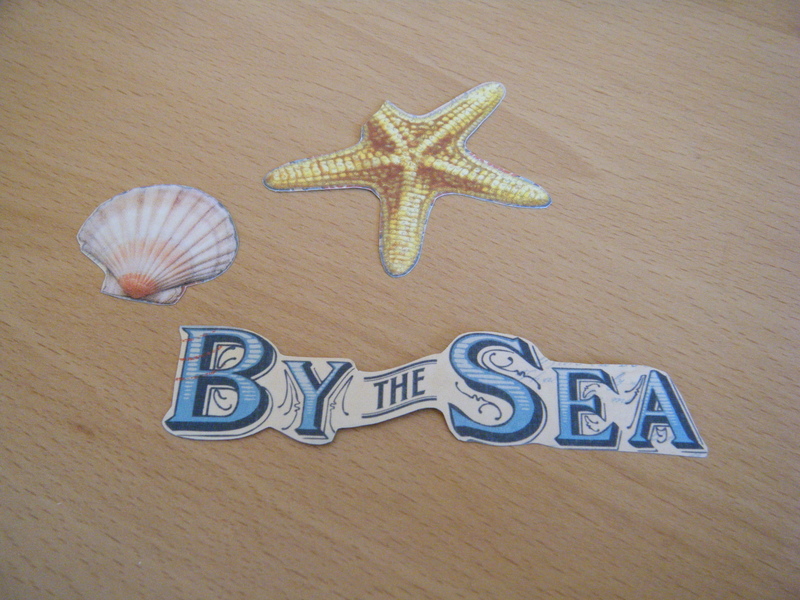 The next step is then to add some letterstickers, rub-ons and some more embellishments. You can use the labels to anchor a page element, so that those elements don’t just float on the page. I used two labels and place under my title. 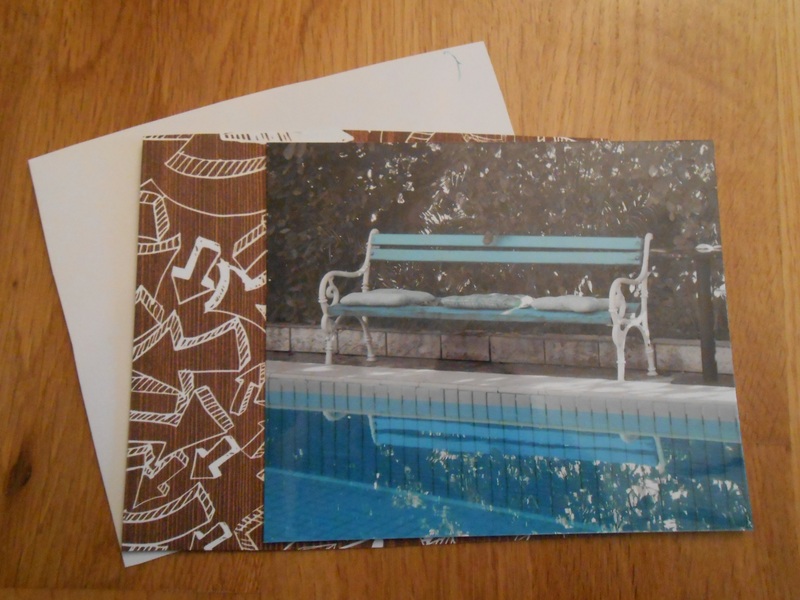 If you use a piece of memorabilia (like I did with this screen-print) don’t be afraid to add some decoration to it. 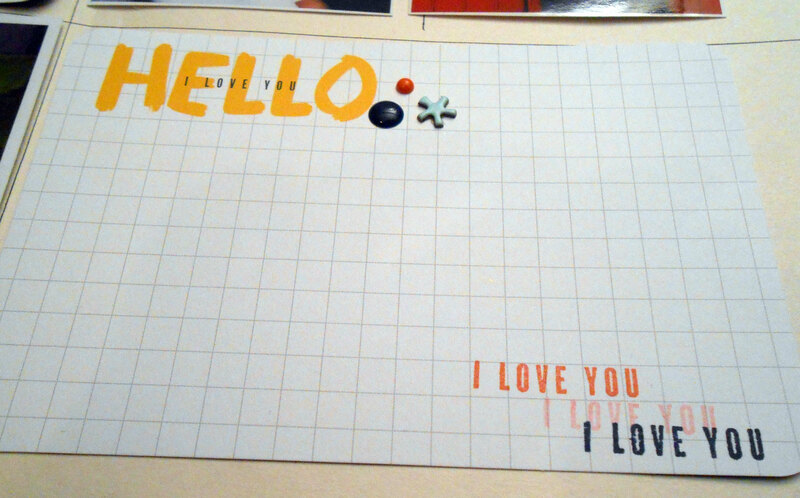 Here I added one label sticker that already had some text on it, and I drew some lines with a ruler for my journalling. 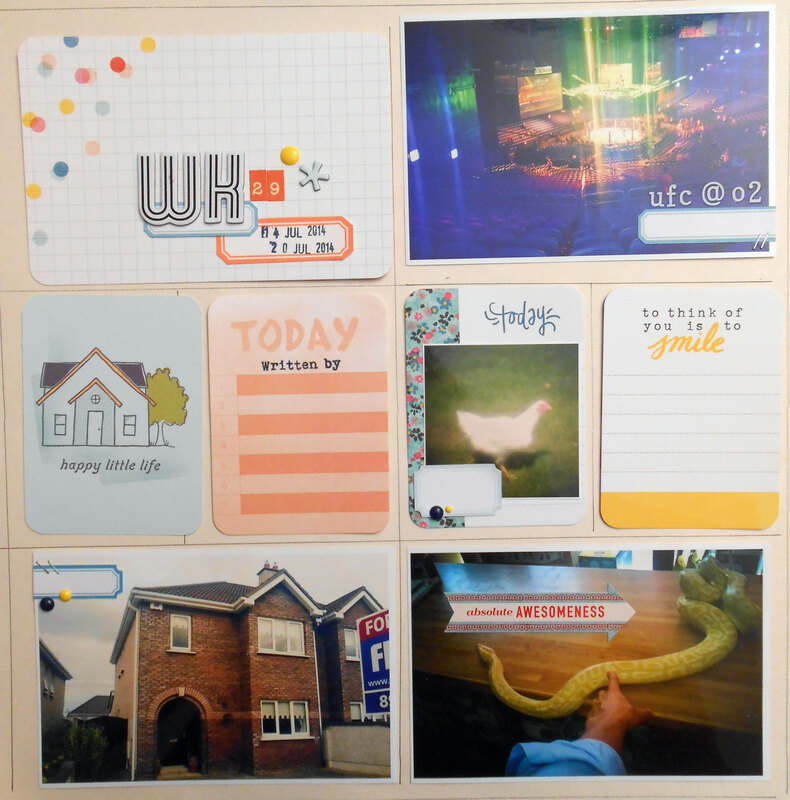 You could also add stamping details to journalling card that has a title already printed on it. I hope you liked these pages and found some inspiration in them. 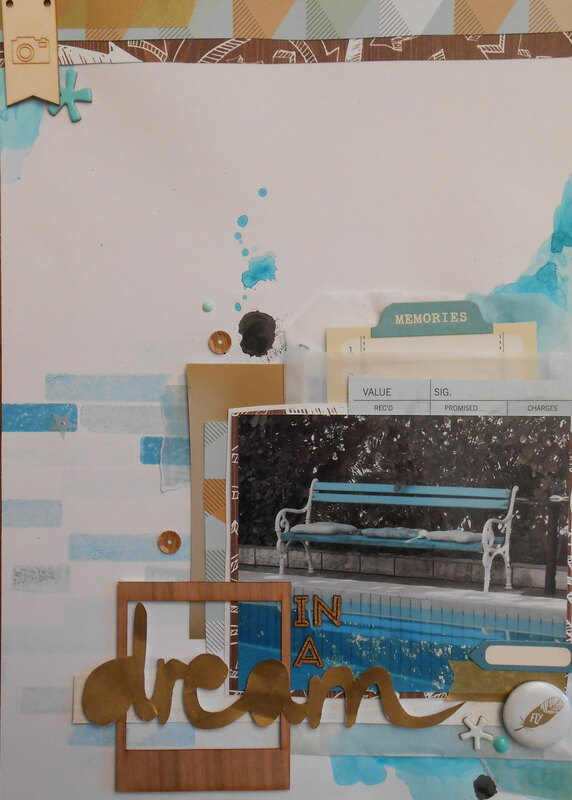 Today Andrea is bringing an art journal page where she used lots of her border punches and dies. First, apply gesso with a pallet knife. 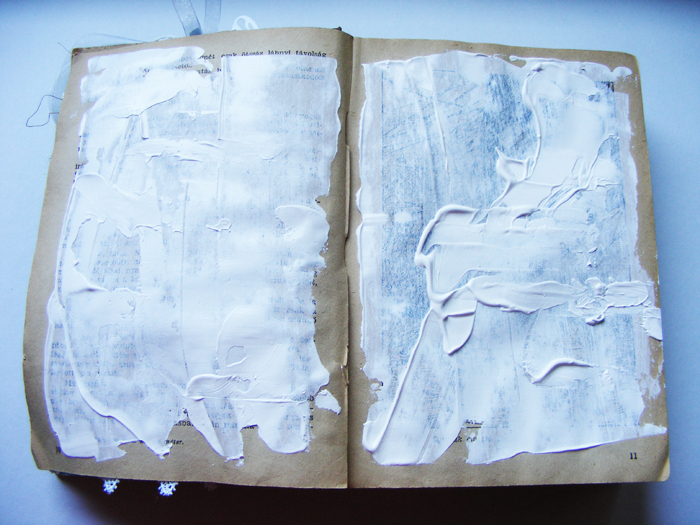 Try to add texture with lots of gesso. 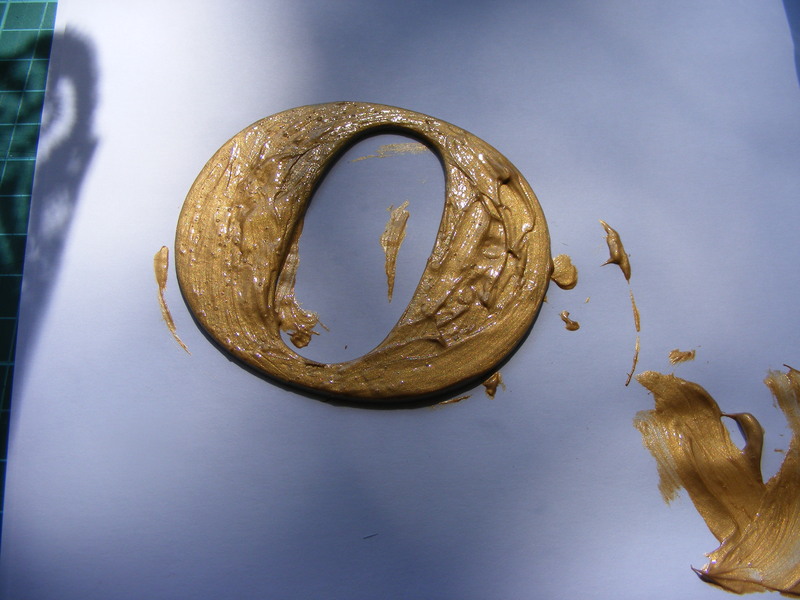 When the layer of gesso is dry then you can start adding layers of acrylic paint. let it dry. And now comes the fun part. 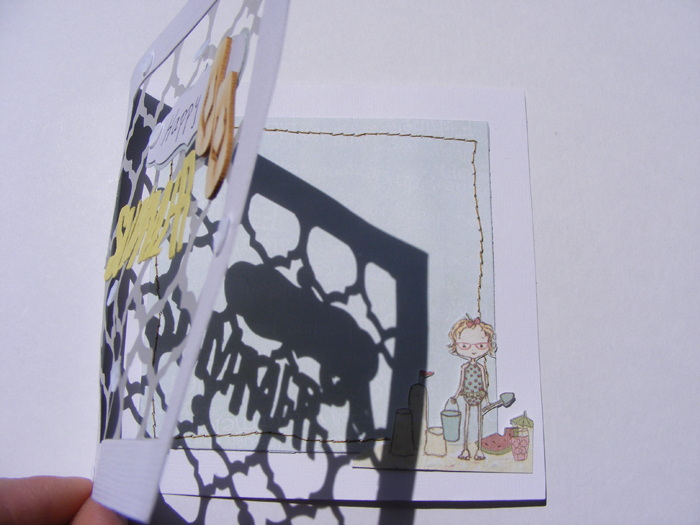 Andrea tried to use only card stock to punch and die cut different broders. 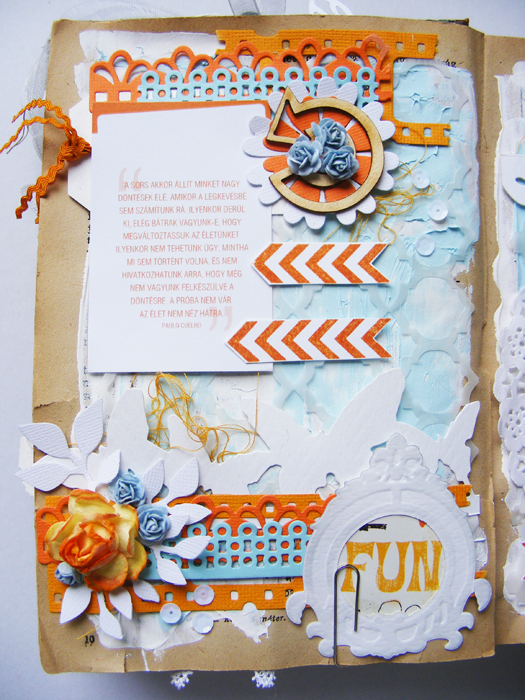 She built these fantastic layers with just using white and orange cardstock. 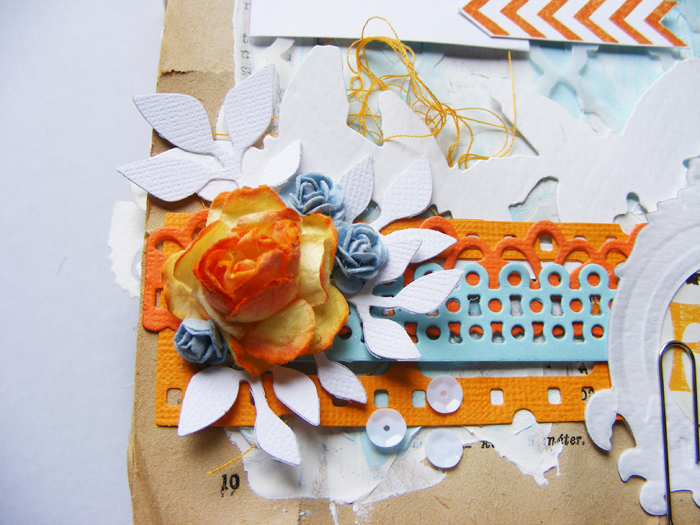 On the top of the layers of borders she added the title and some bulkier embellishments, like the paper flowers. On one side she left space for a quote and on the other side for a photo. To make sure that you incorporate the quote or the photo in the composition, you have tp treat it as one of the layers and preferably add one more layer on the top. This could be a frame or some butterflies on the side of the photo. It is nice to keep the two pages in balance with each other, this way they will create a composition together. 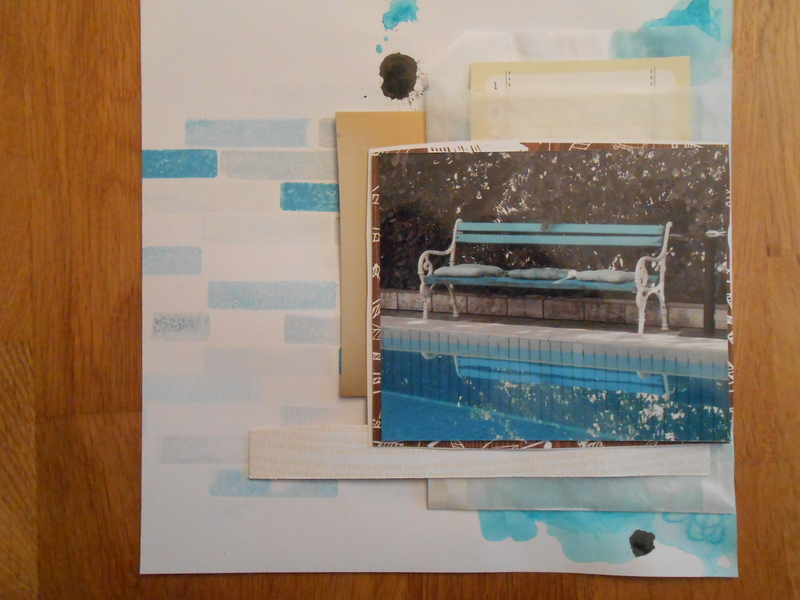 This is the finished art journal spread. We hope you like the idea of using those border punches again! 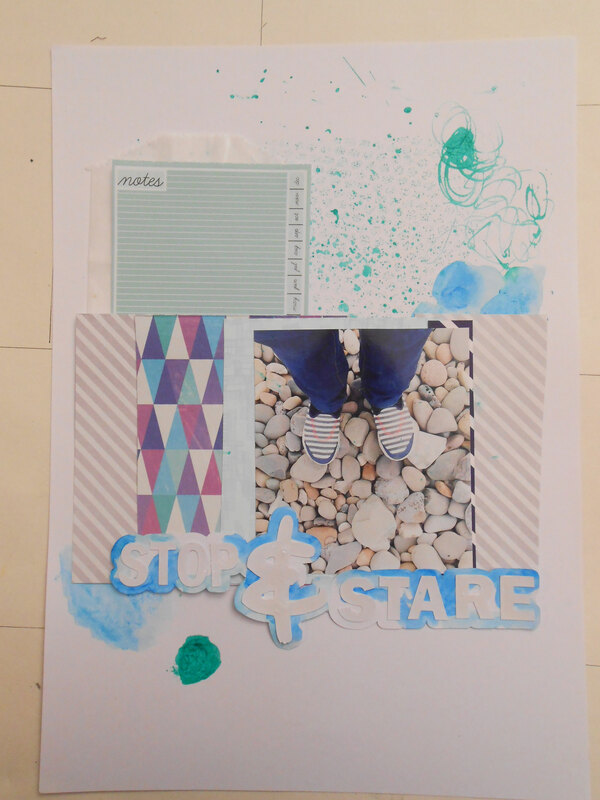 It is Timi here with a scrapbook page tutorial. Recently I am really into geometric designs. They look so fab on scrapbook pages too. 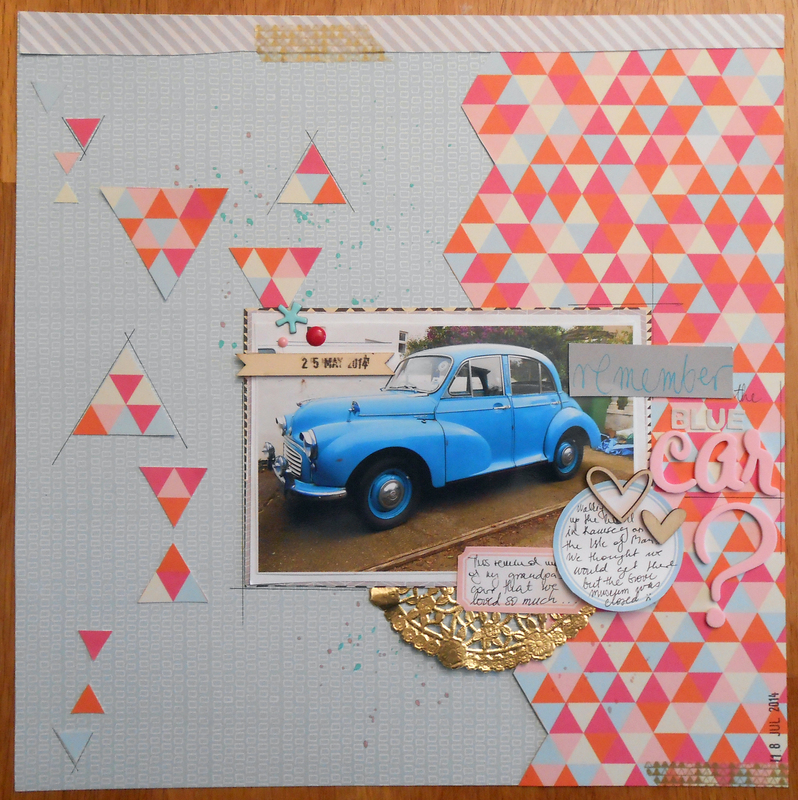 Here’s how I created a page with all lots of colours and triangles. 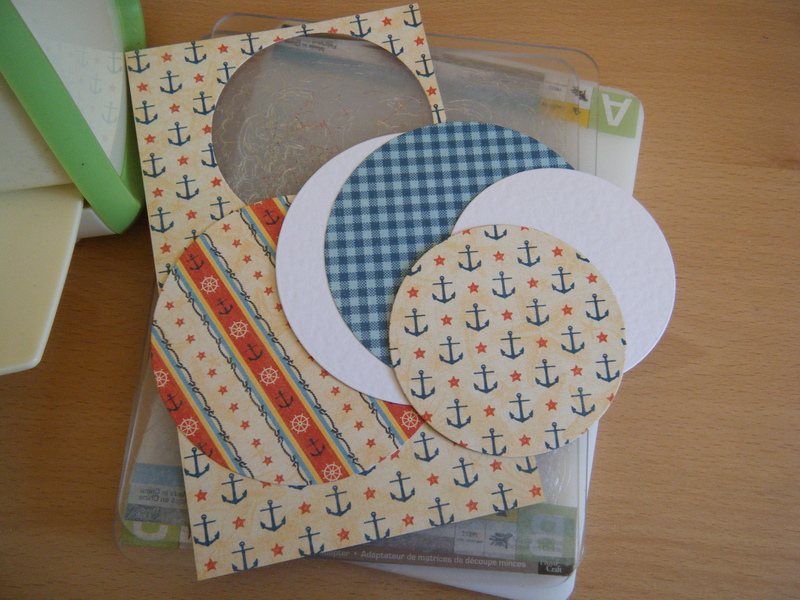 Take the patterned paper that you want to use. I chose one with lots of triangles and the other one had some light pattern on it, I chose the latter one for the background. 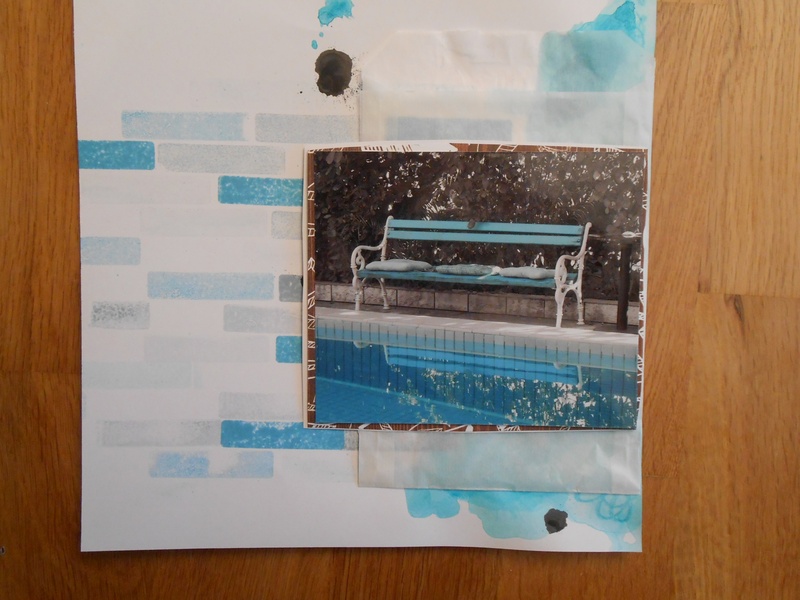 Layer the photo you are going to use on some smaller pieces of patterned paper. I used I layer of white copy paper and two layers of patterned paper. 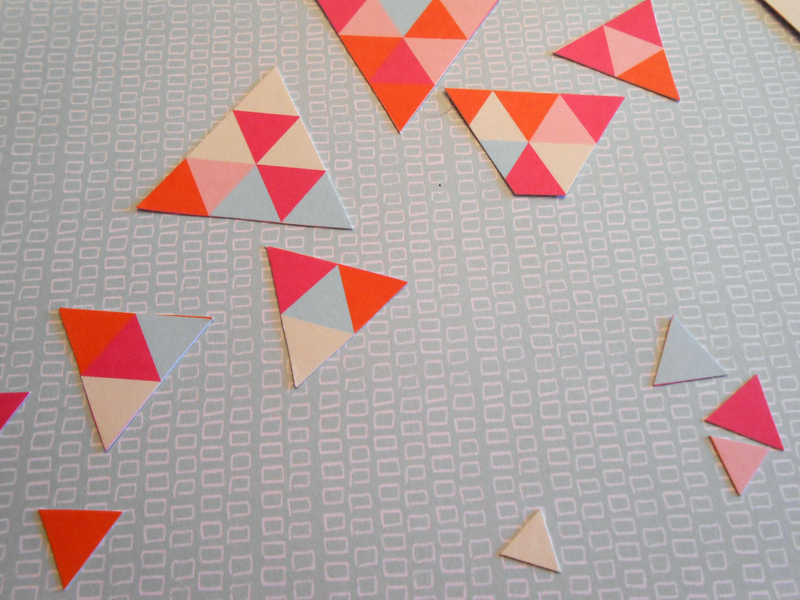 Cut out some triangles, small ones and bigger ones. Add some ink splashes to the background. Place the photo where you want it. Layer it with a piece of doily paper and some labels. Here you can add some other embellishments too. 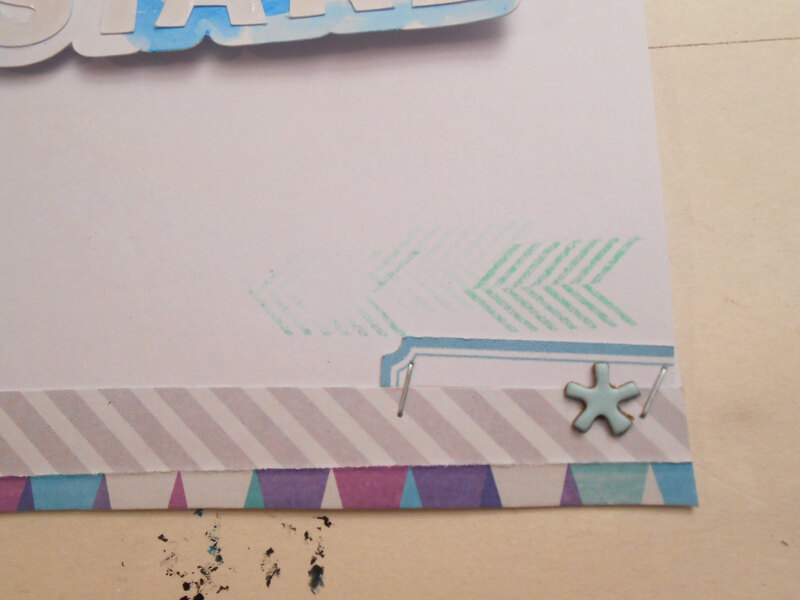 I added a strip of grey-white patterned paper to the top of the page. 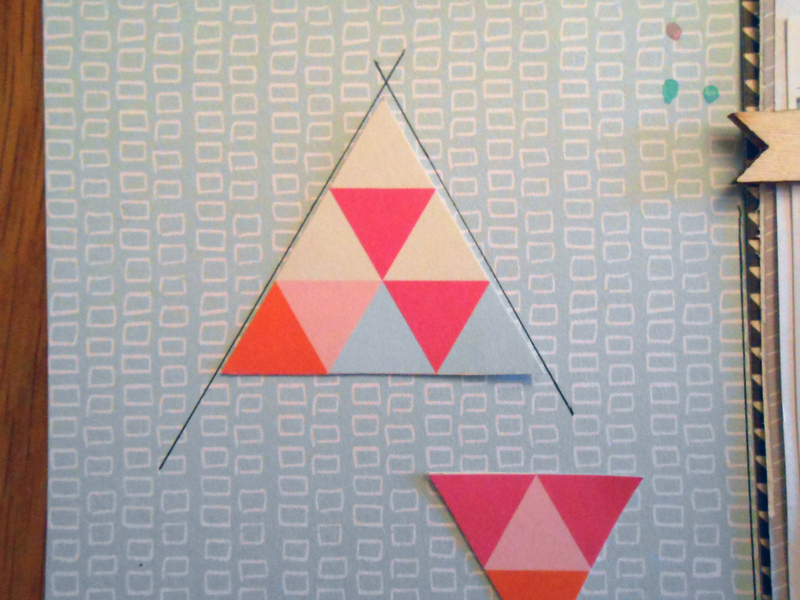 And placed the triangles on the left hand side of the page. By now I decided that I wasn’t happy with the orange label, so I changed it to a light pink one. For more interest I drew some straight but sketchy lines around some of the triangles and the photo. Add your title and journalling. I change the layout a little bit along the way. I took the ‘remember’ mini title from the top and completed my main title with it. 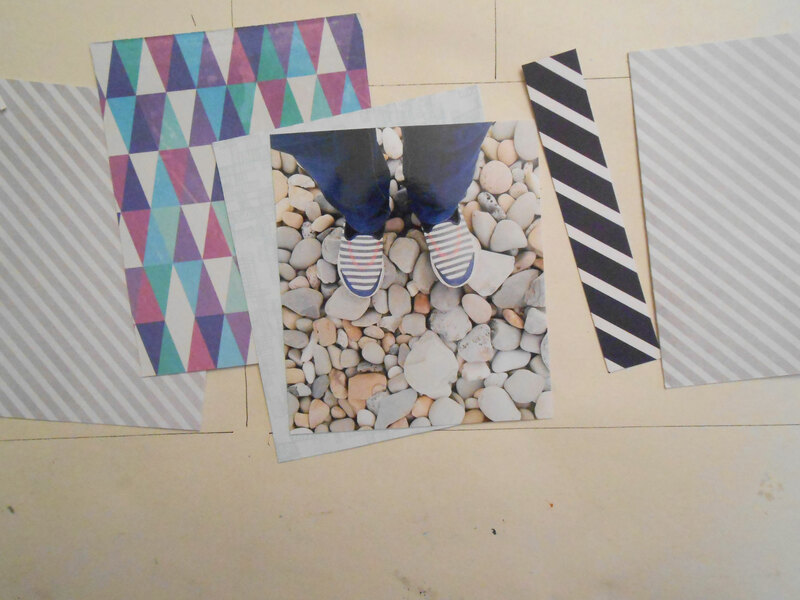 Remember to add some washi tape too for more interest. 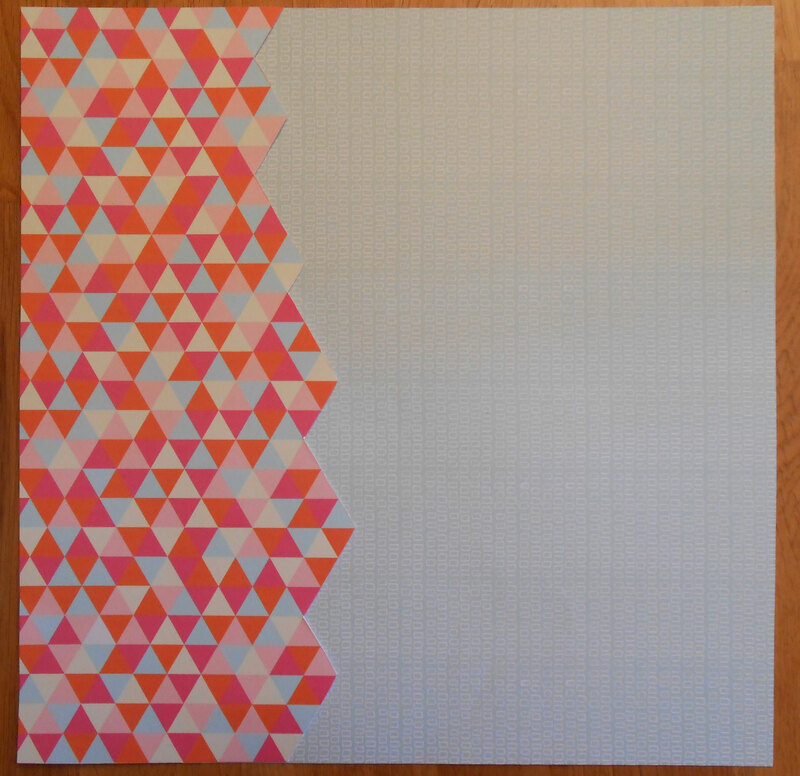 I hope you like this page and you will enjoy creating something with geometric shapes too. 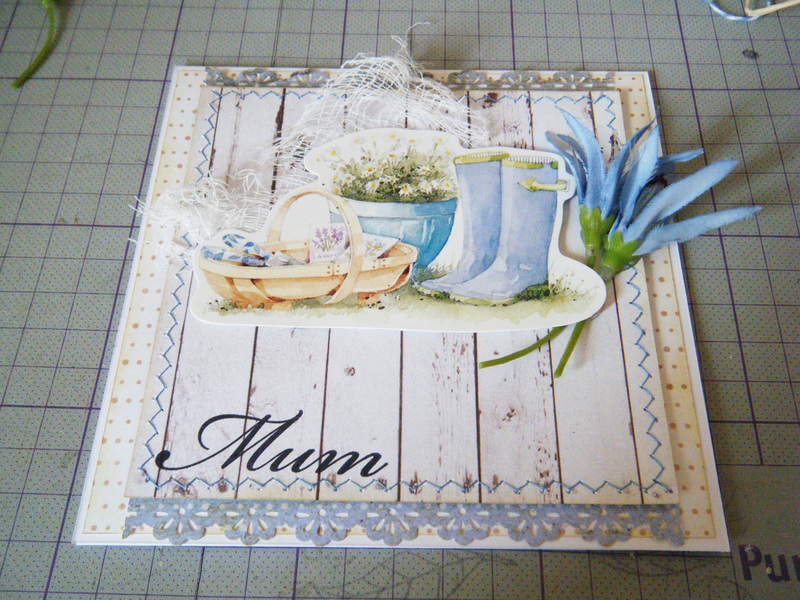 Today Andrea, our DT member is going to show you a quick summer card to create. 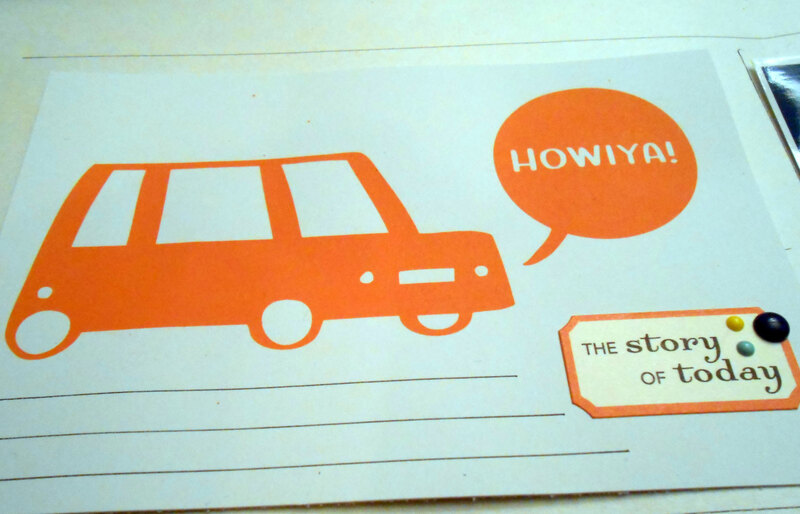 Cut a window on the front of the card. 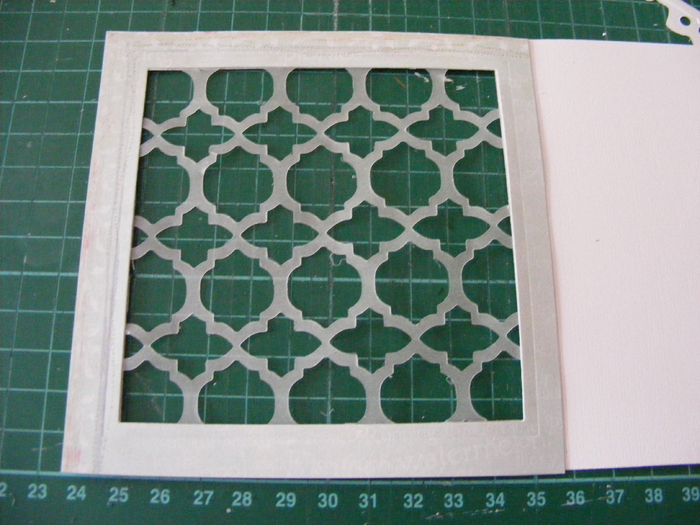 Cut the patterned paper to size. 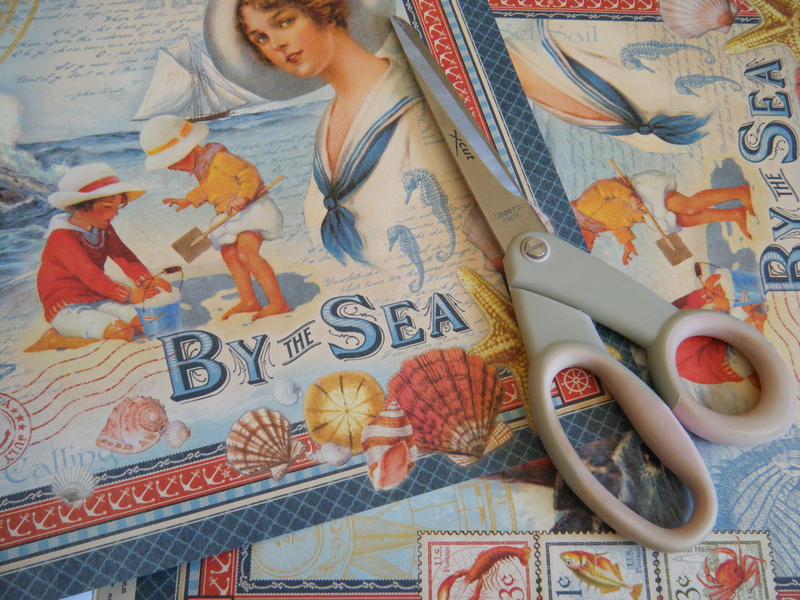 Die cut a fishing net like background from vellum. 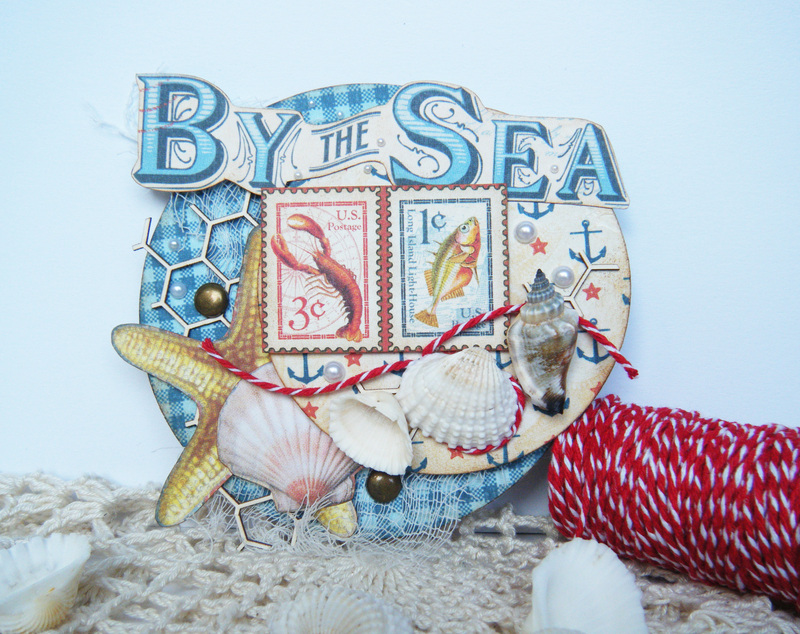 If you don’t have an electronic cutting machine, you can use anything that reminds you to fishing net to achieve a beach feel to this card. 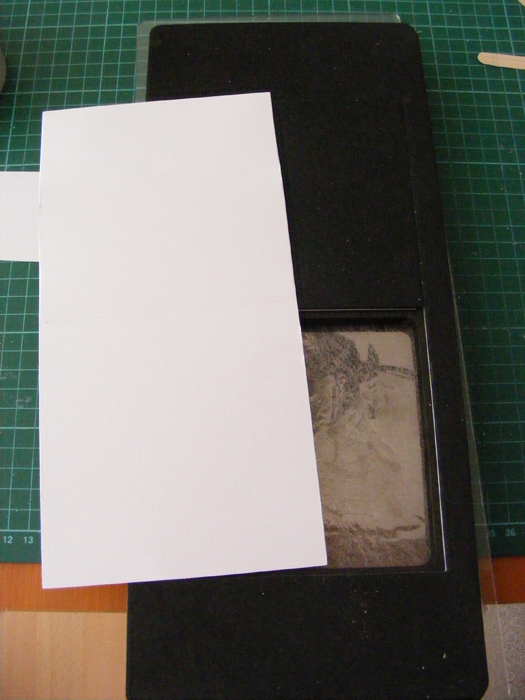 Cut the vellum to size and attache it to the back of the window on the card. 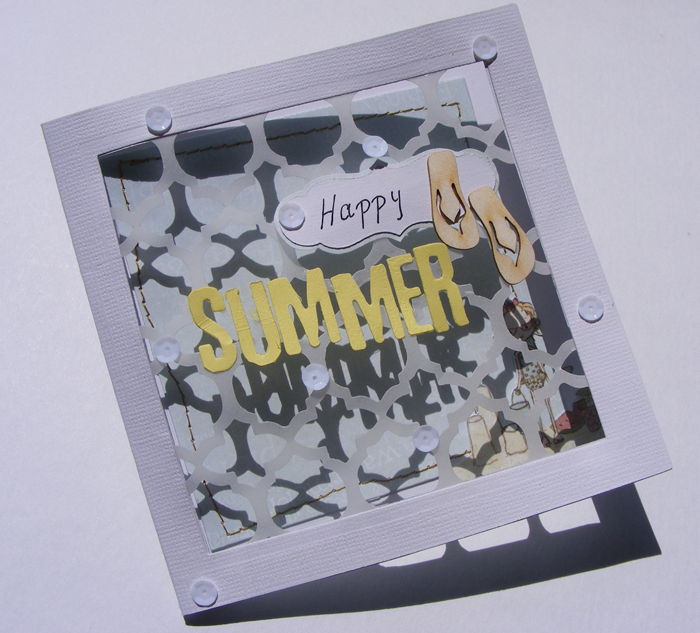 Add sentiment using die cut letters or alpha stickers and add the summer themed embellishments. 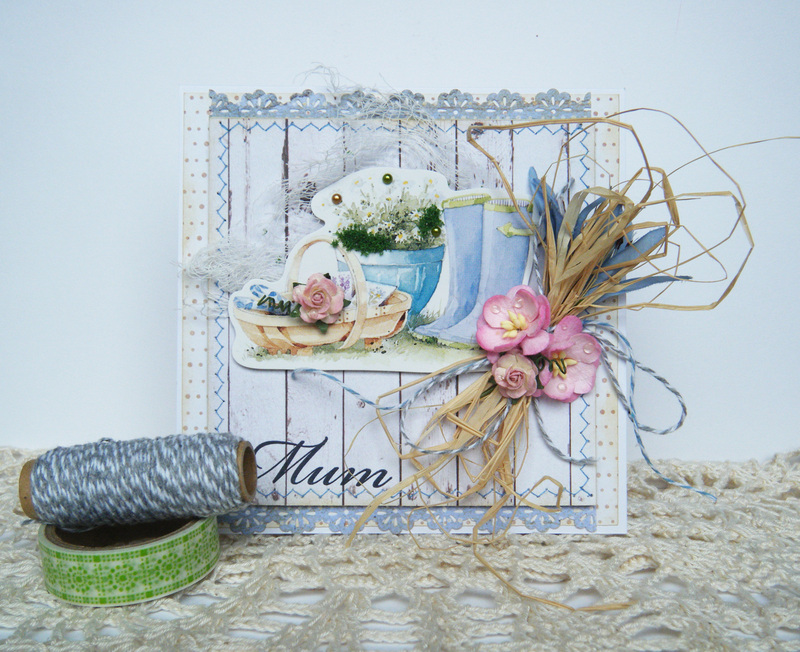 And there you have a fantastic summer themed card!! 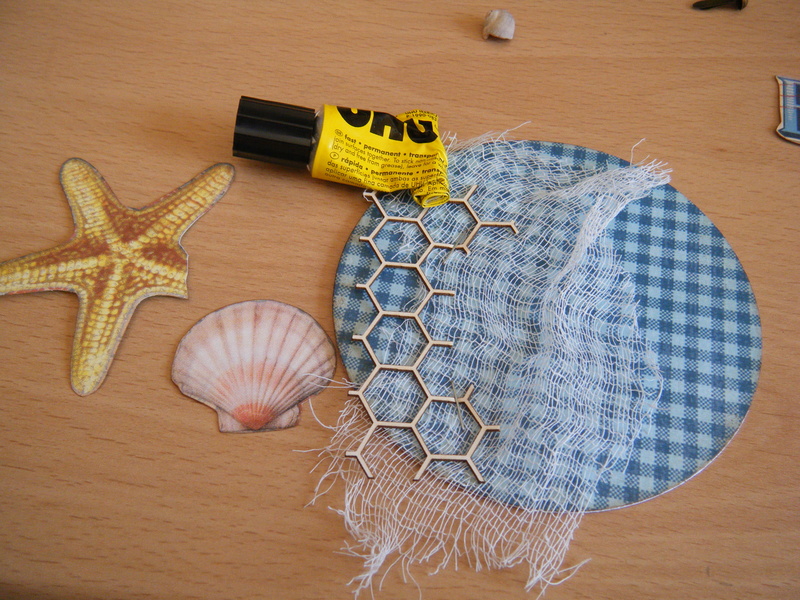 We hope you like this tutorial and we inspired you to create something summer themed. Today is the 1st July. I can’t believe that we are already in the second half of 2014. 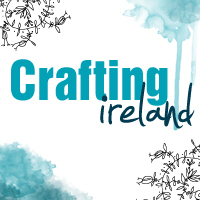 The summer arrived in Ireland and we are enjoying these sunny days. 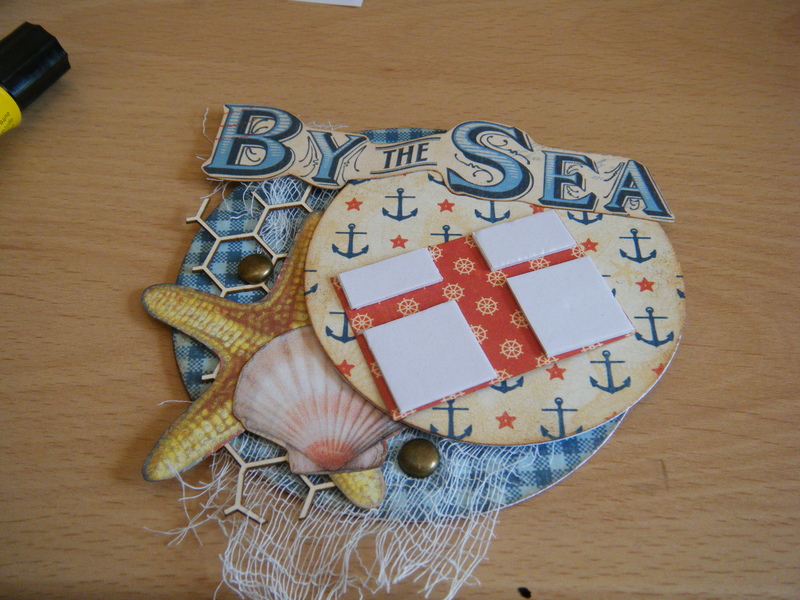 Inspired by the beach and sunshine Katya created a fridge magnet and she is going to share her process with you. 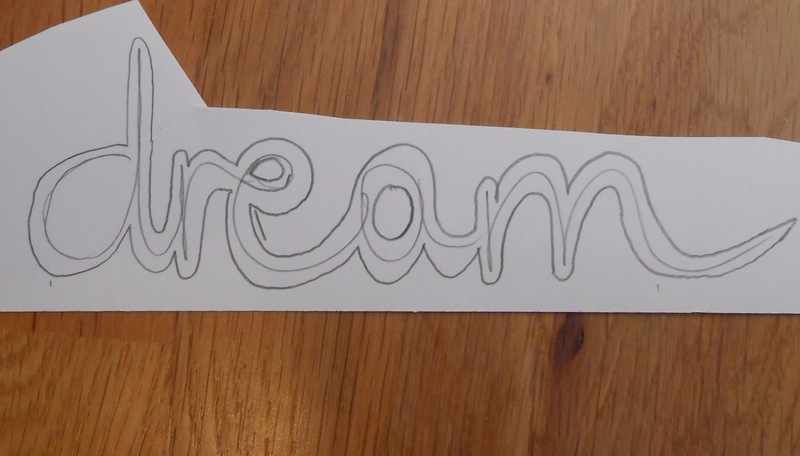 You can distress all the edges of the papers- this step is optional. 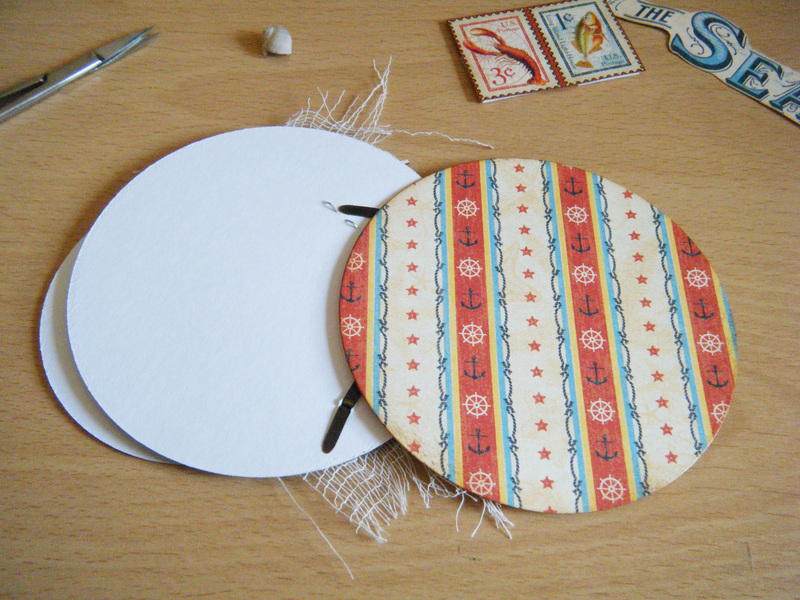 Now we will take 1 big cardstock circles and 1 paper circle and glue them together. 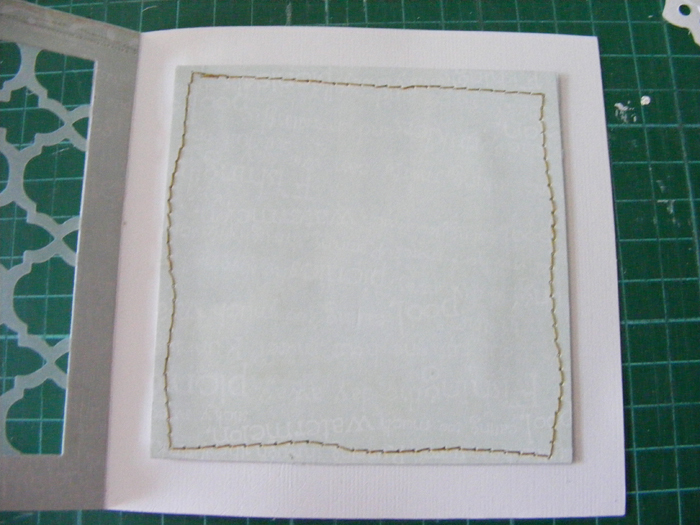 I have added some cheesecloth to imitate a net and some chipboard. I fixed them with a stapler, don’t’ worry about the staples, we will cover them later and you wont see them. 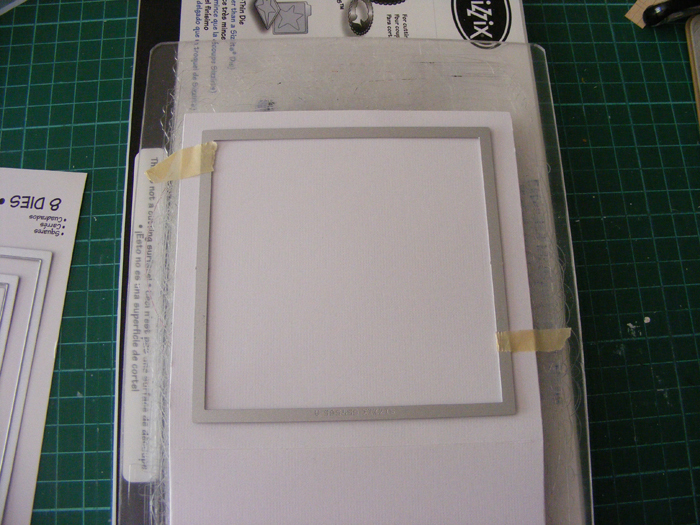 Cover the back of the magnet with scrapbooking papers, so you won’t be able to see the back of brads. And here is the finished fridge magnet! We hope you liked this absolutely gorgeous summer project. 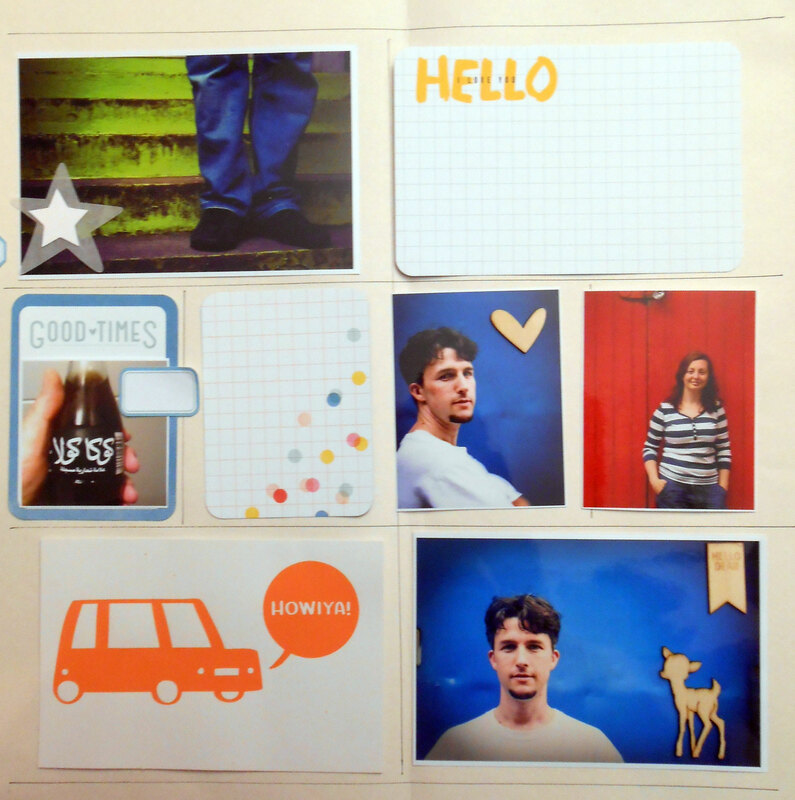 Today it is our Design Team member, Katya is going to share a project with you. 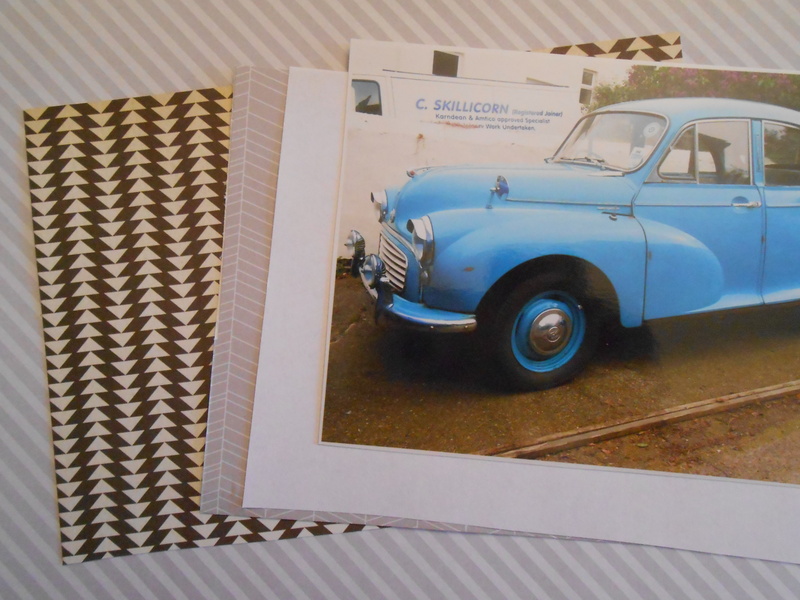 scrapbooking papers- 2 patterns- as we have gardening theme, try to pick papers with some sort of natural or neutral print- blues, greens, browns or beige. Put the second layer of papers onto foam tape. Beforehand I also stitched around the sides of the square. 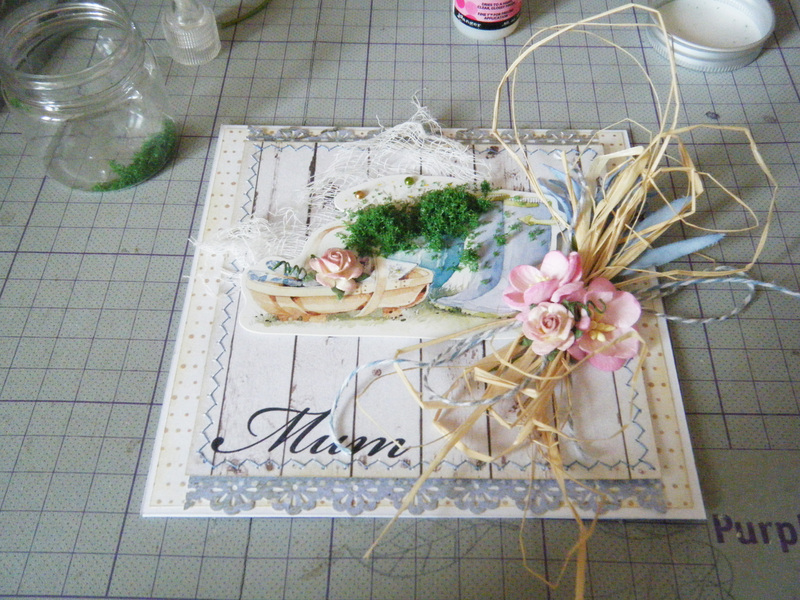 Now I start adding some embelishments- cheesecloth under the sticker, some flowers. This is how the final project looks like. 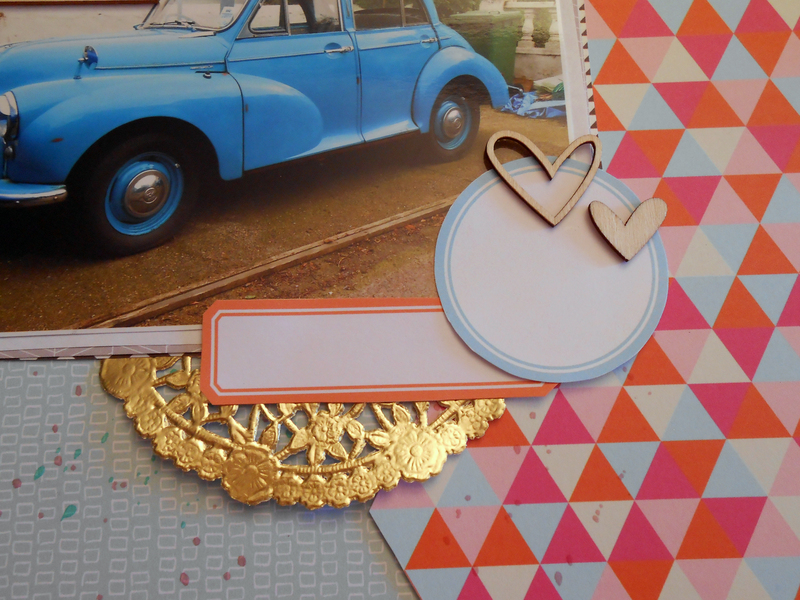 We hope you like this very cute card tutorial. It is Timi here today and I brought you a layout tutorial with some fun techniques in it. Recently I really enjoy working on A4 pages (8.5×11 in USA). 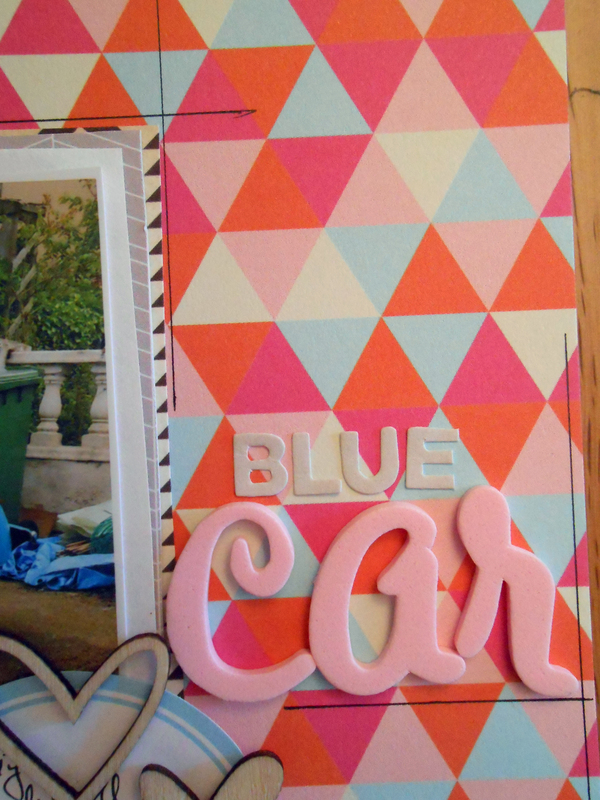 I feel it is a whole new world of scrapbooking. First you need to prepare the background. 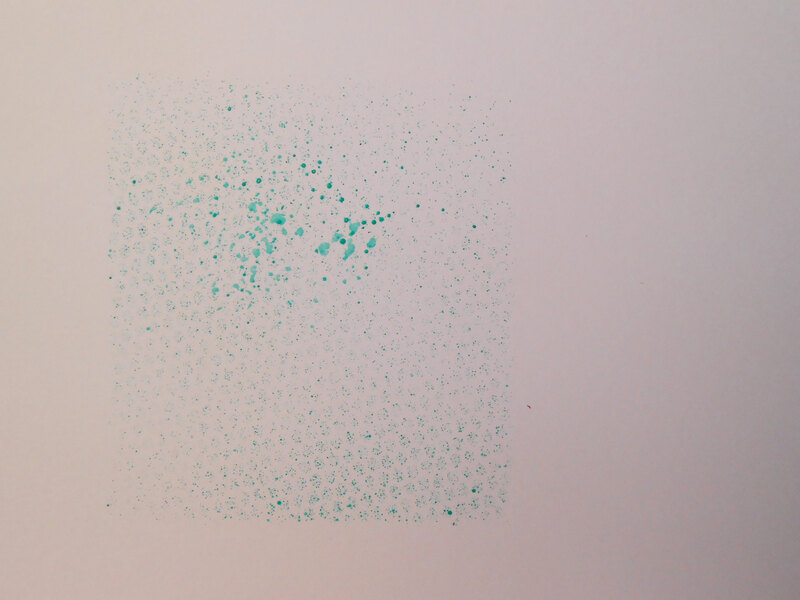 I wanted to mix up geometric patterns with some watercolours, so I started with the stamping. 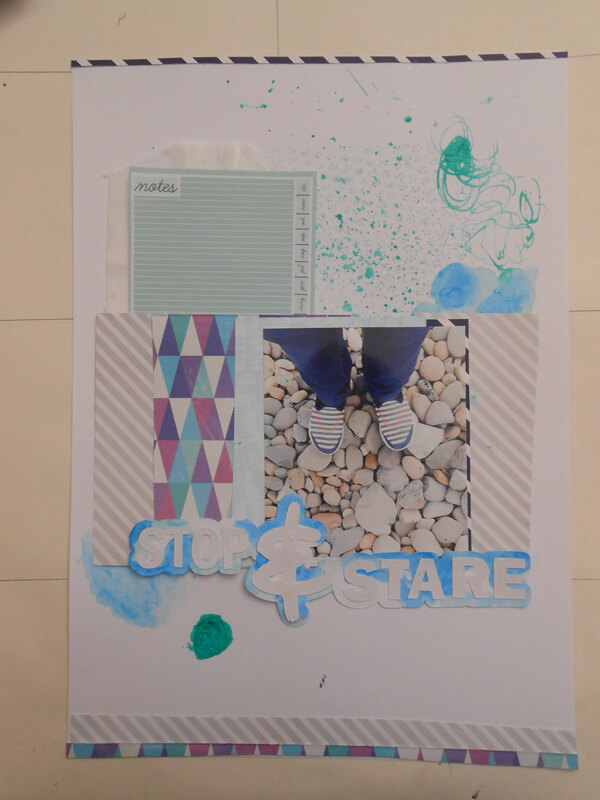 Mark where your photo is going to be and start stamping a shape that you like. It can be a square, rectangle, triangle, anything that you like. 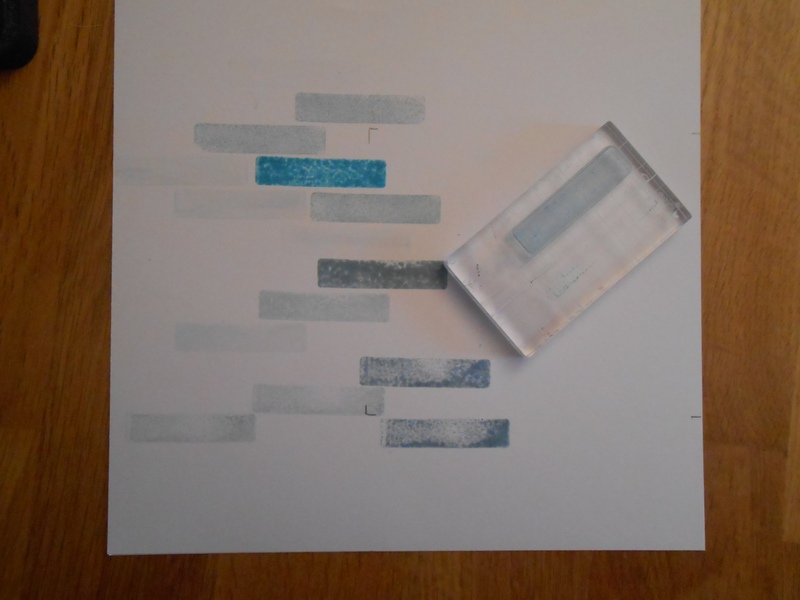 Use a few different colours of ink and to achieve a faded effect, do not re ink your stamp after every stamping. 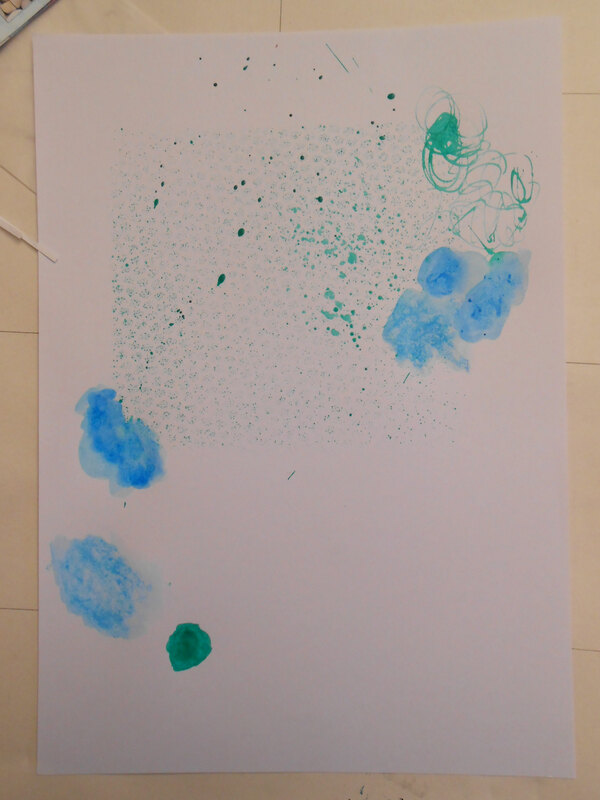 Get your watercolour media and start adding splashes to the other side of the paper. Dry it with a heat gun. 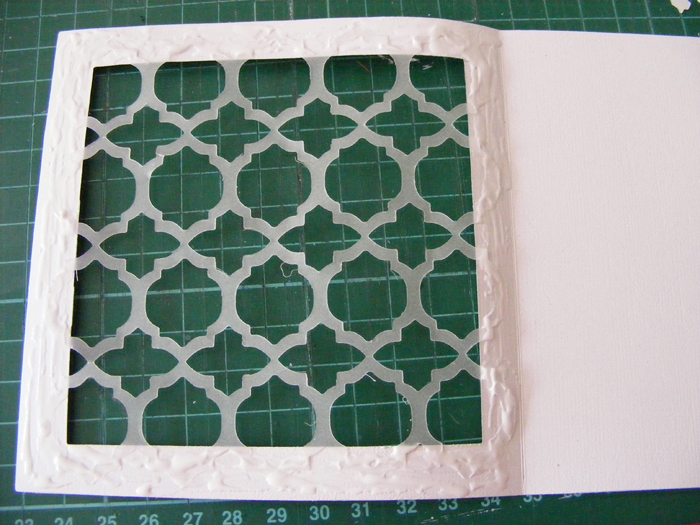 Start layering the glassine envelop and other pieces of patterned paper. I like to move my things around quite a bit before committing. 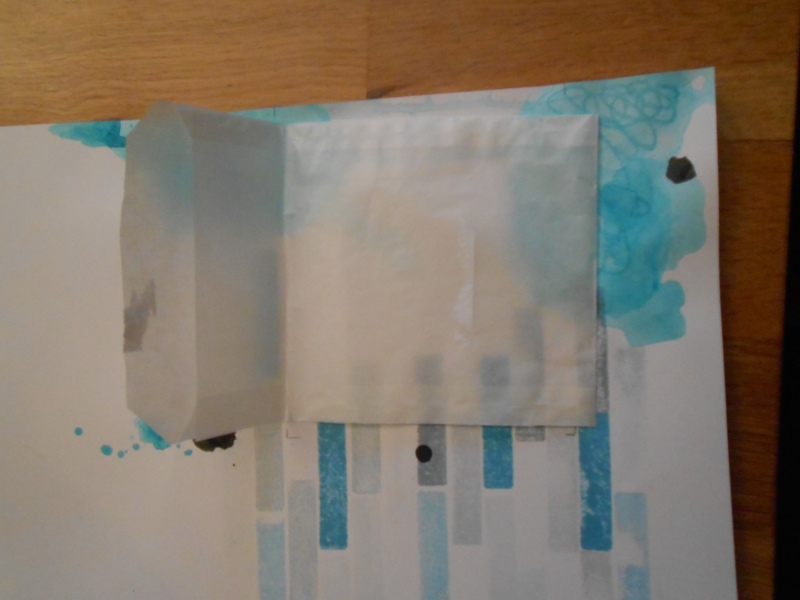 Into the glassine envelope I chose to put my journalling card. 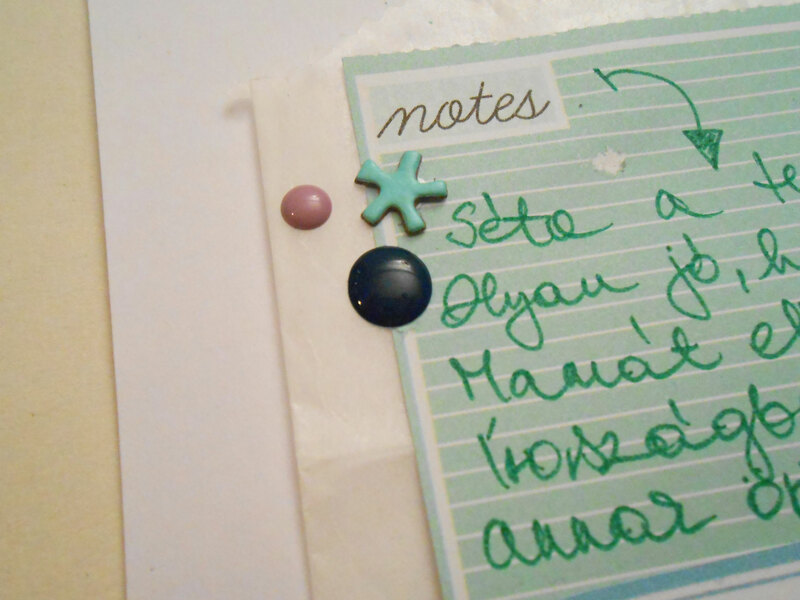 I used mini staples to stop the journaling card falling into the bottom of the pocket. 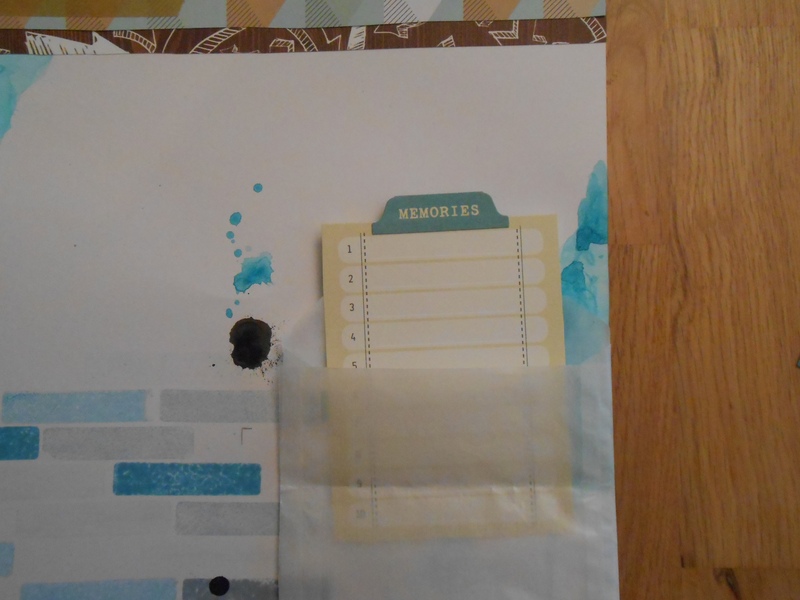 I also added a tab sticker to the top of the journalling card, so it is now nice and easy to pull it out. If you like the idea of using your own handwriting on a layout, just write it out on a paper, trace it around and cut it out. I colored mine gold. 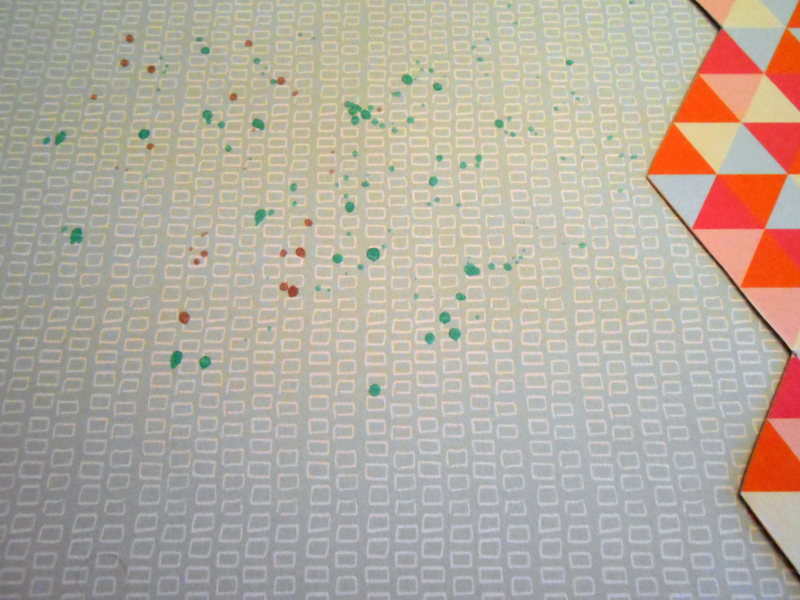 As a final step I added some sequins and enamel dots. I hope you liked this layout and it will inspire you to try something new.